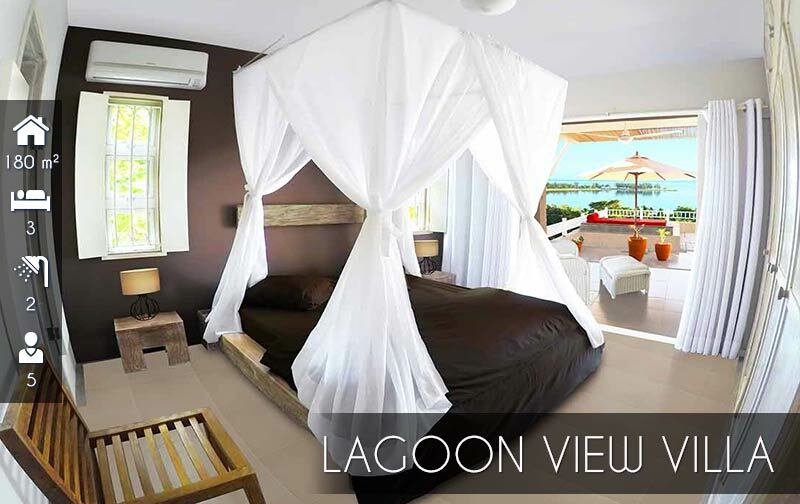 Perched high up on Le Morne Mountain, Kozy Le Morne Villa unfolds 1 Lagoon View Suite, 1 Seaview Suite as well as 1 Island View Suite. 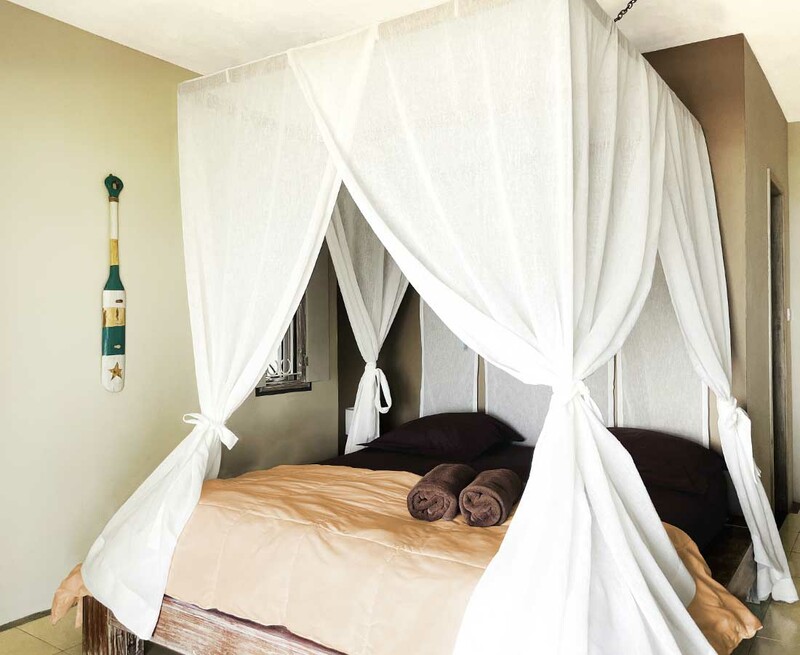 Perfect for a private getaway, the 3 cosy accommodations will make your life no less than a royalty. 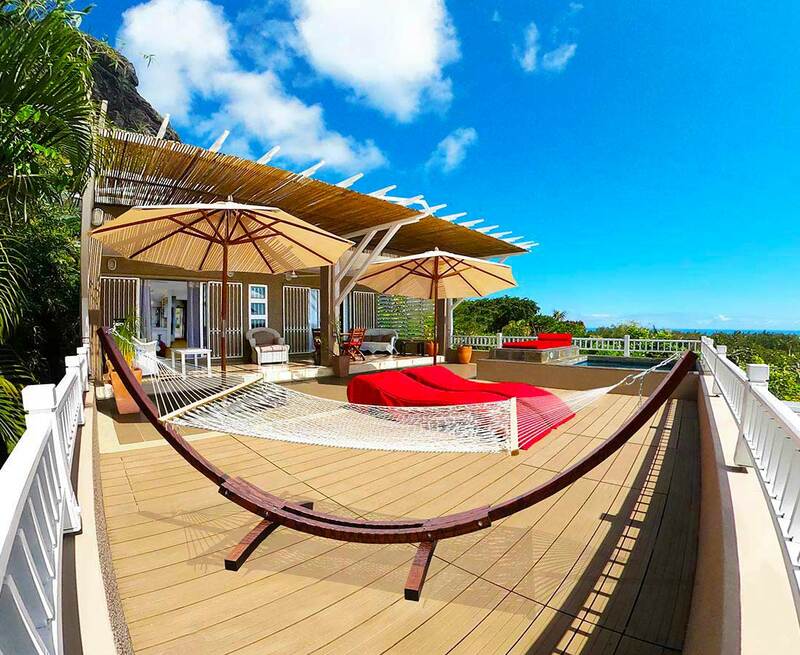 So relax and feel like one, with nature in Le Morne, Mauritius ! 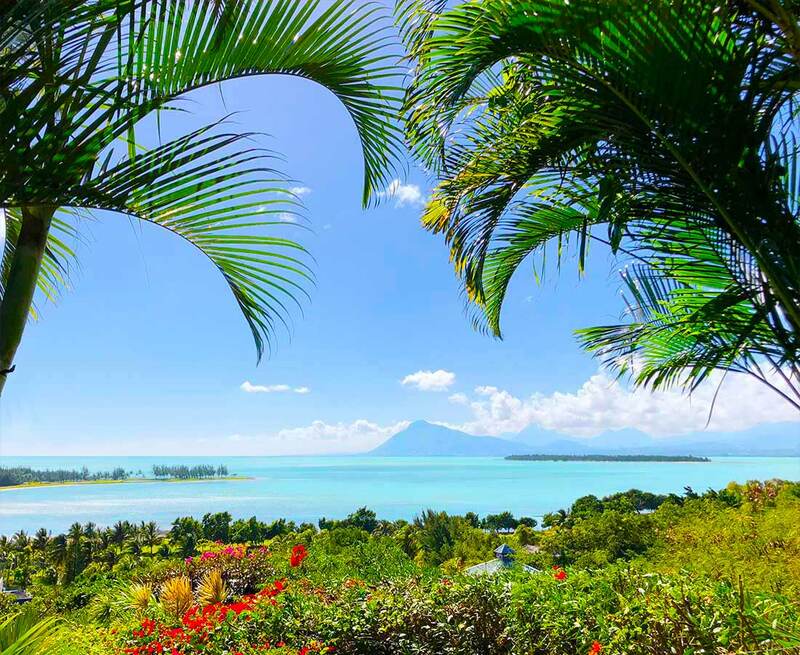 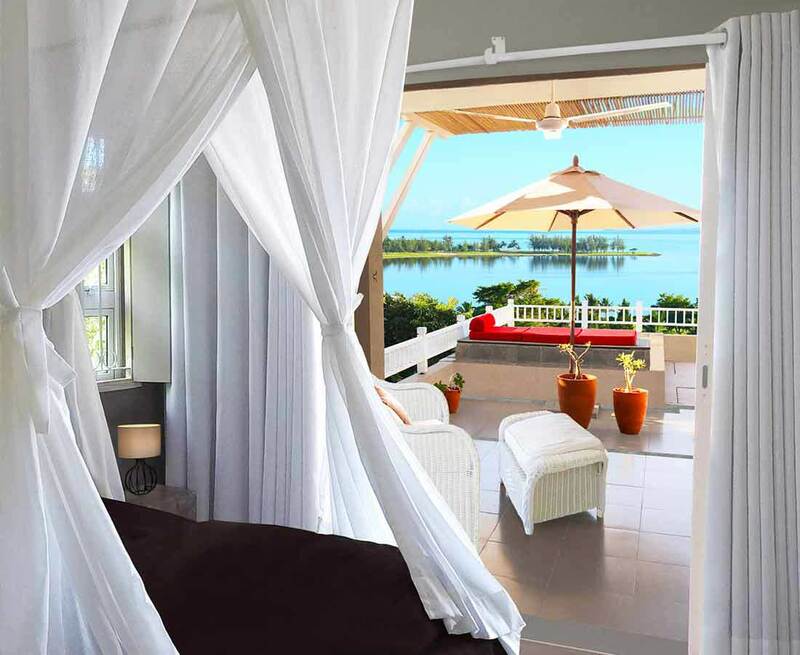 With clouds floating away to the yonder skies, the sea gently lashing against the shores and trees rubbing each other in the wind while their leaves soar away to a destination unknown to you … But however well known for being the place to be in the south west of Mauritius. 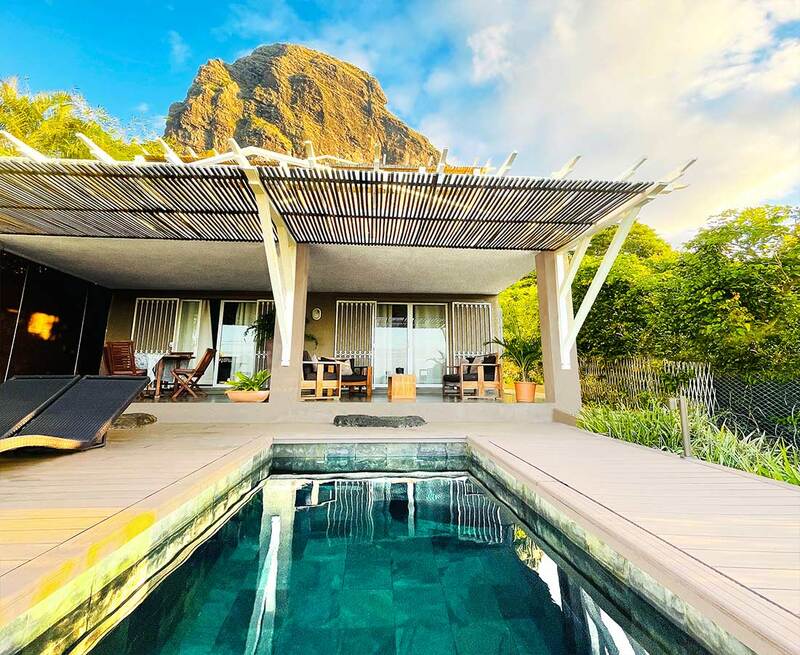 Kozy Le Morne Villa is the perfect escape in the heart of nature for wanderlust travellers. 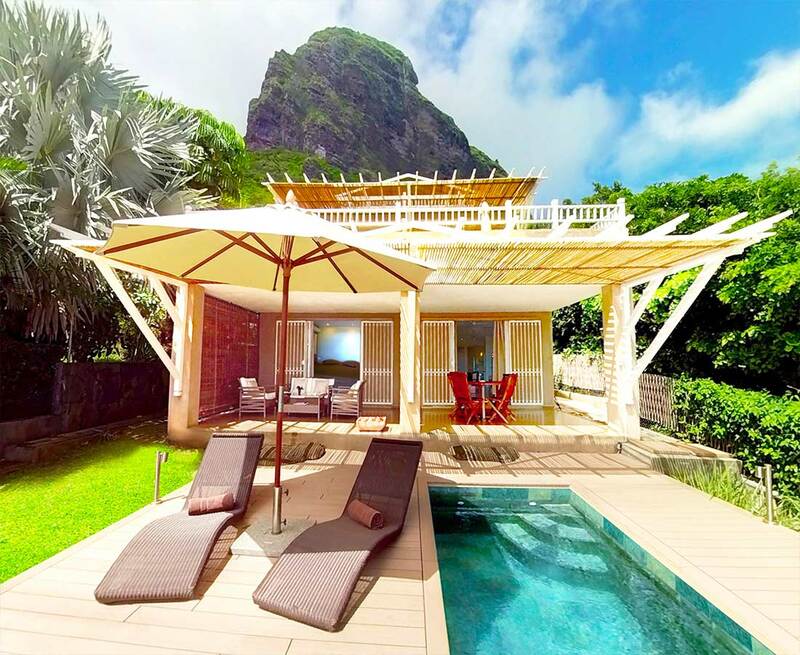 If the sun rises against the majestic UNESCO World Heritage Site : Le Morne Brabant, it is a brand new day when you wake up in the suites of Kozy Le Morne Villa. 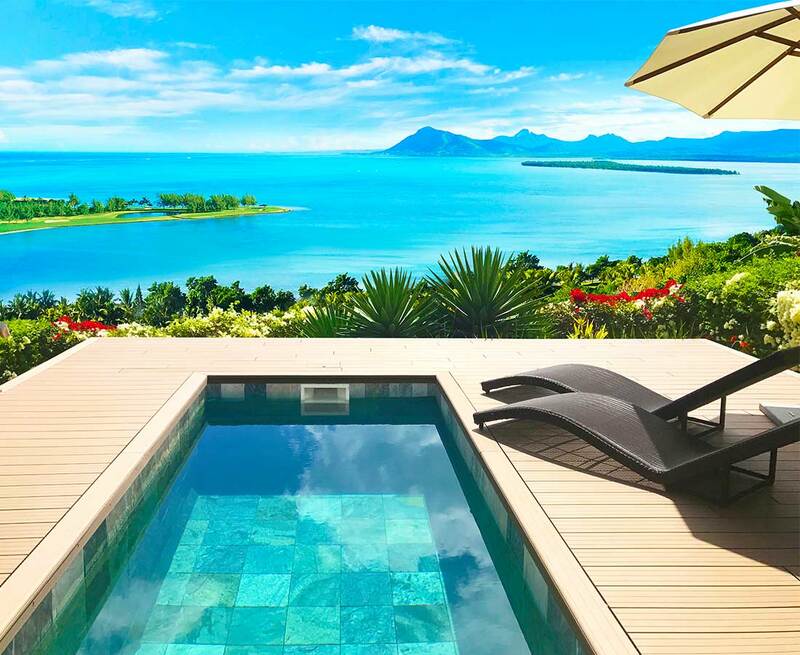 Choice is yours ! 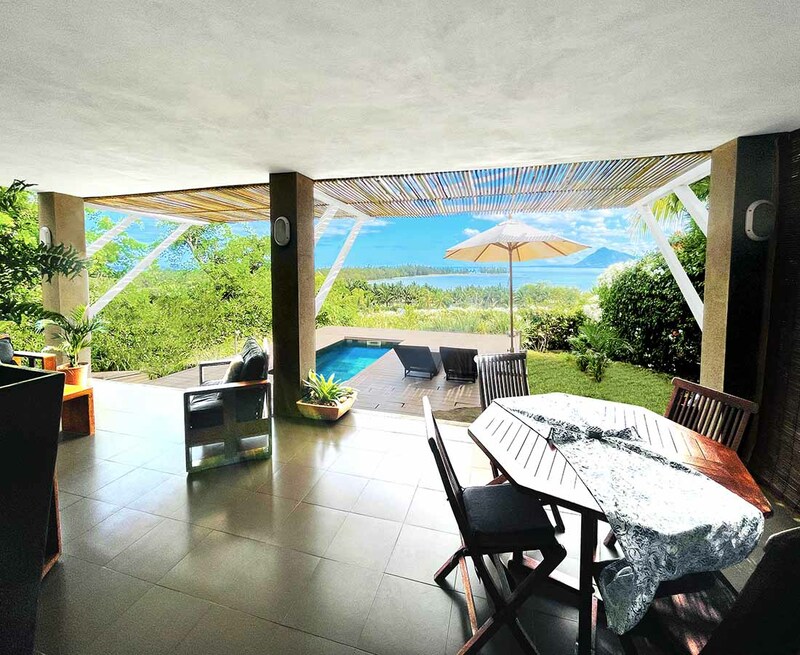 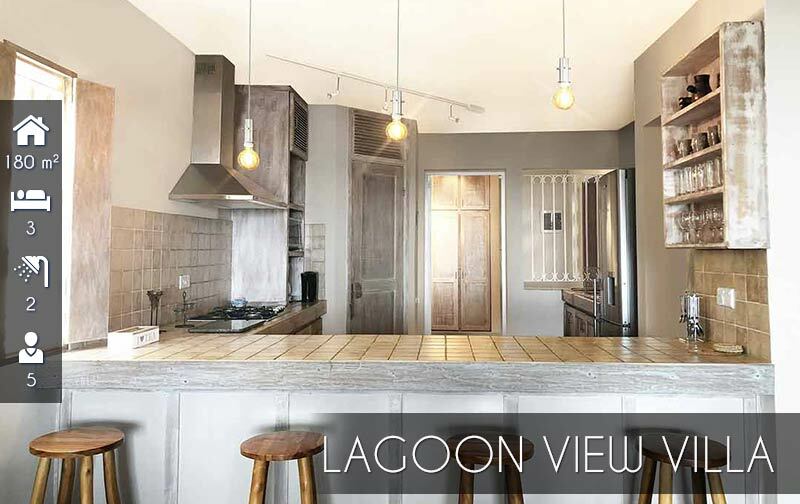 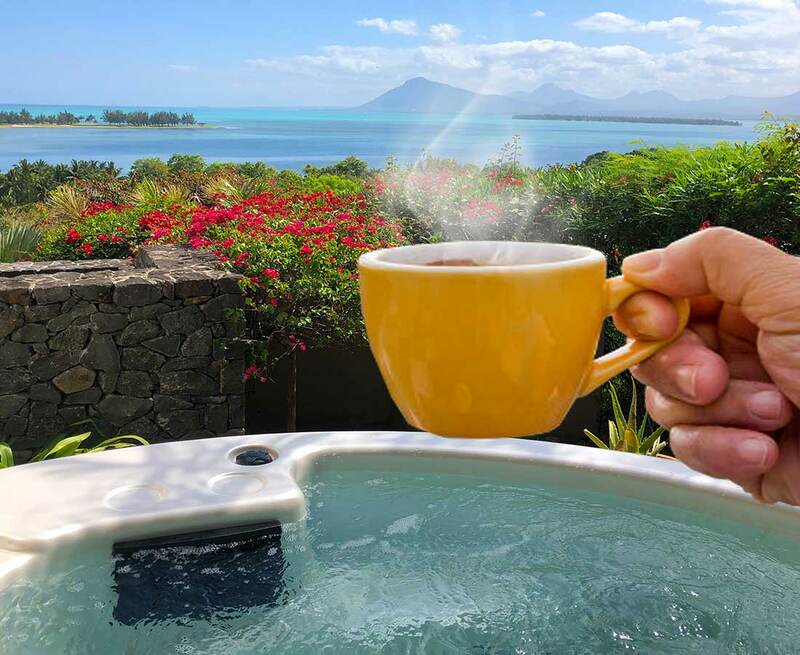 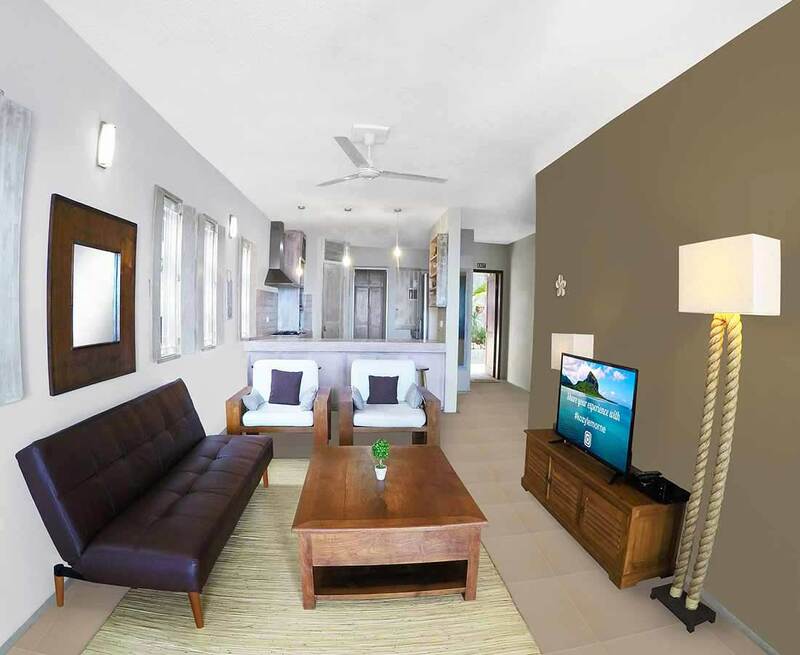 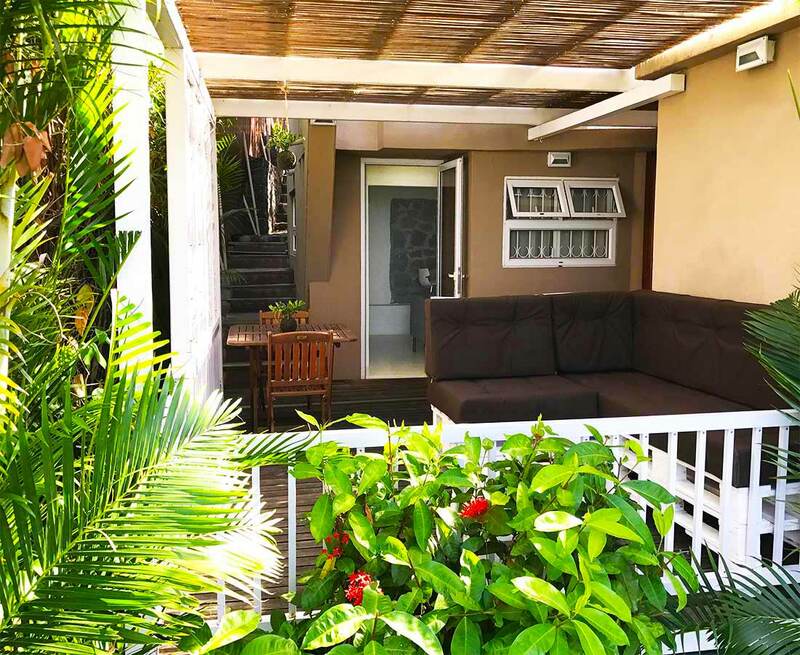 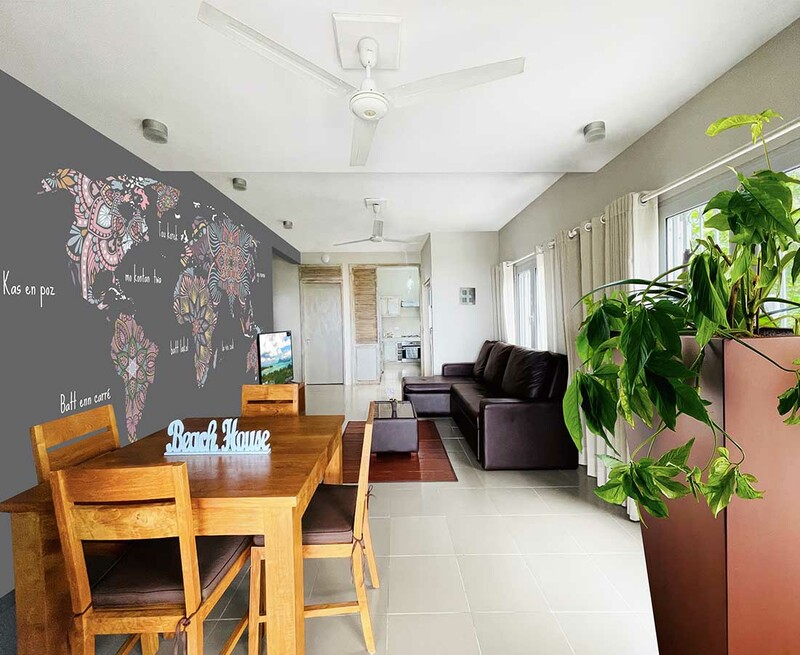 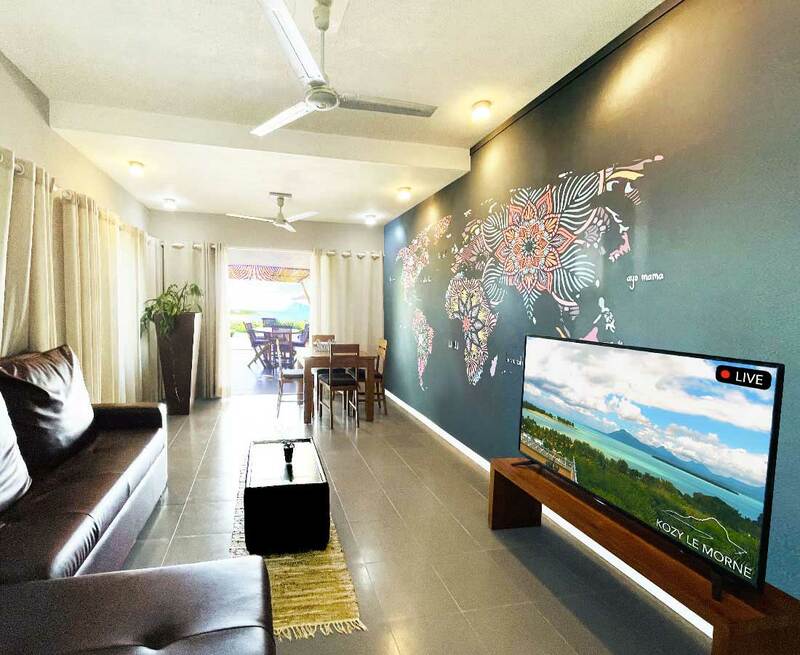 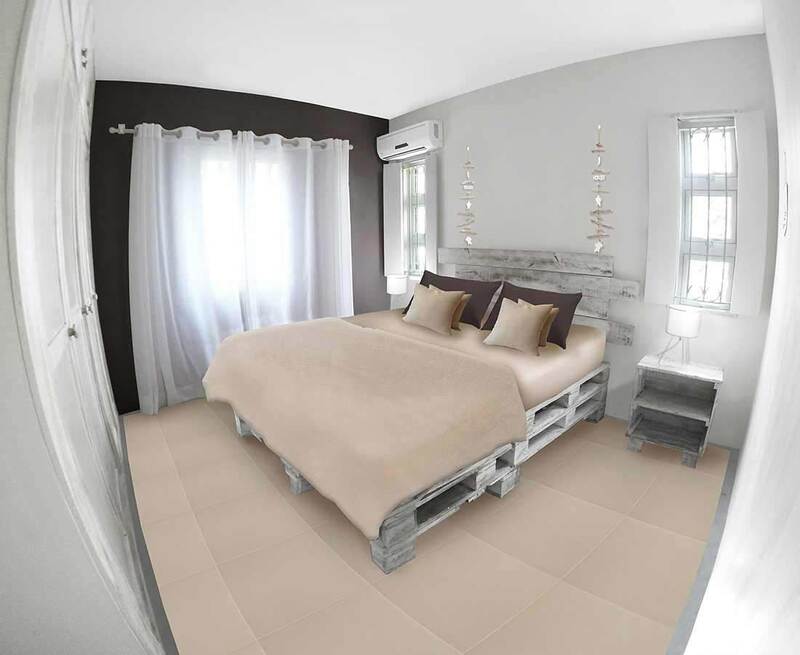 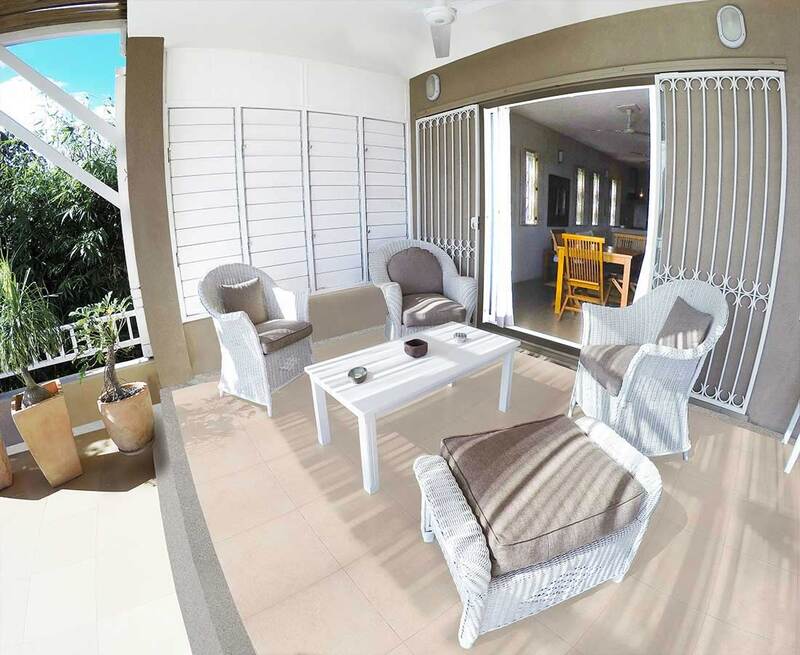 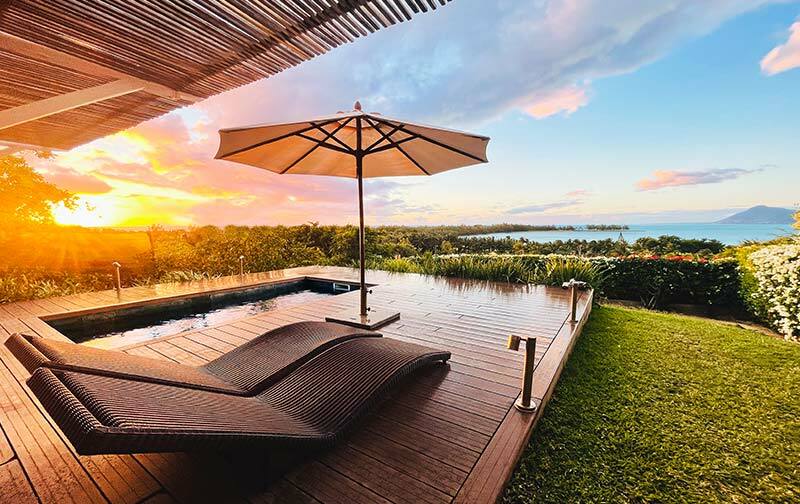 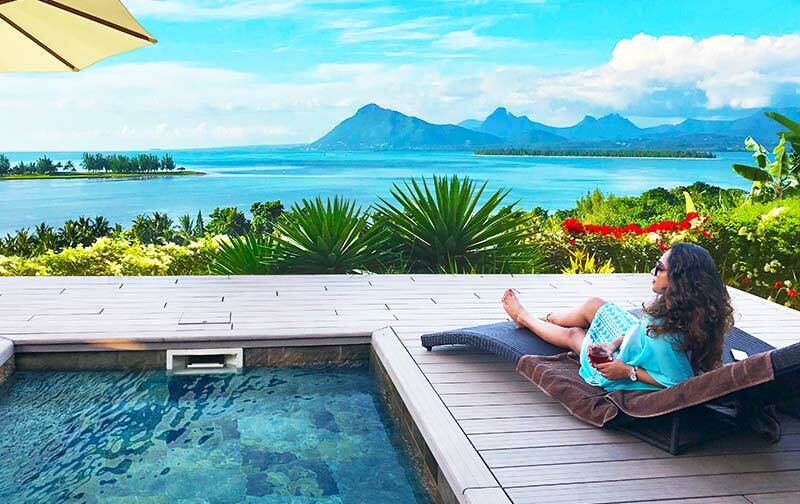 Ornella & Eric, the hosts, just want you to keep calm and rejoice life in their modern styled villa, with panoramic sea and mountain views situated at Le Morne, Mauritius. 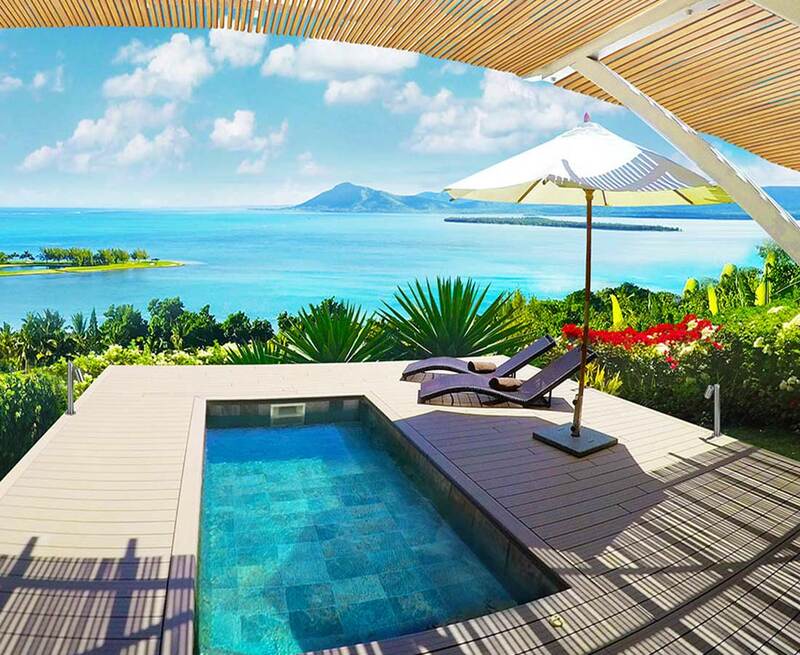 Whoever said that money can’t buy happiness, we simply believe they didn’t know where to go shopping ! 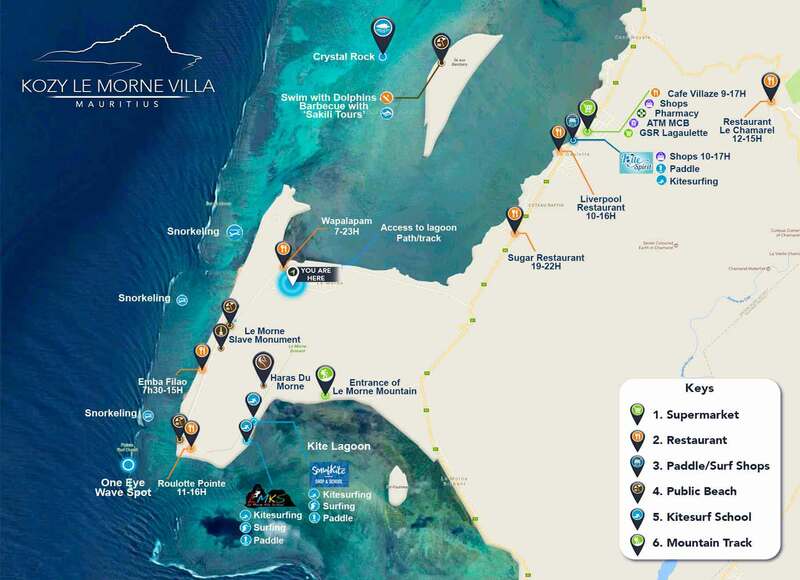 So check out the map, eat in your favourite restaurant, sleep at Kozy Villa Le Morne, shop nearby , kitesurf at the various spots , have a drink at Wapalapam and repeat till you drop. 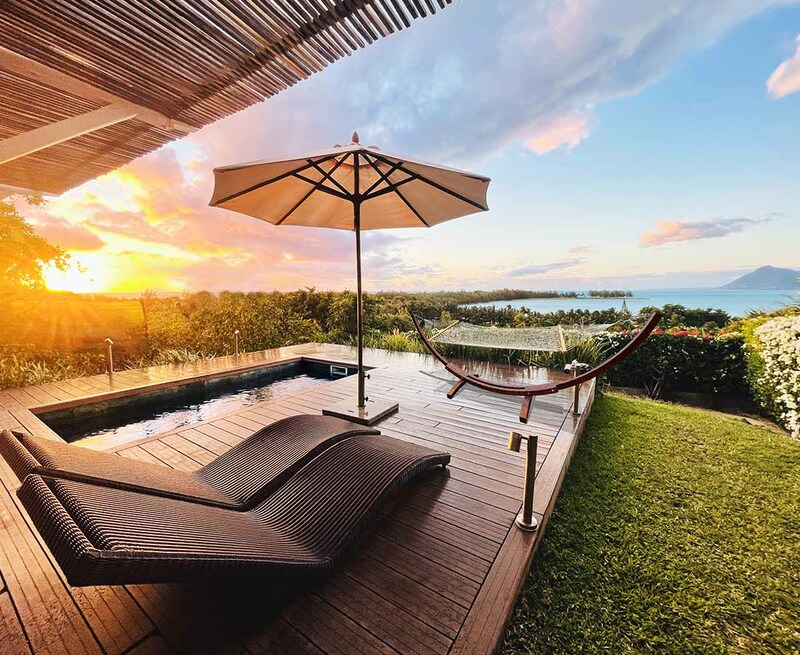 There's a sunrise and a sunset every single day and they're absolutely free. 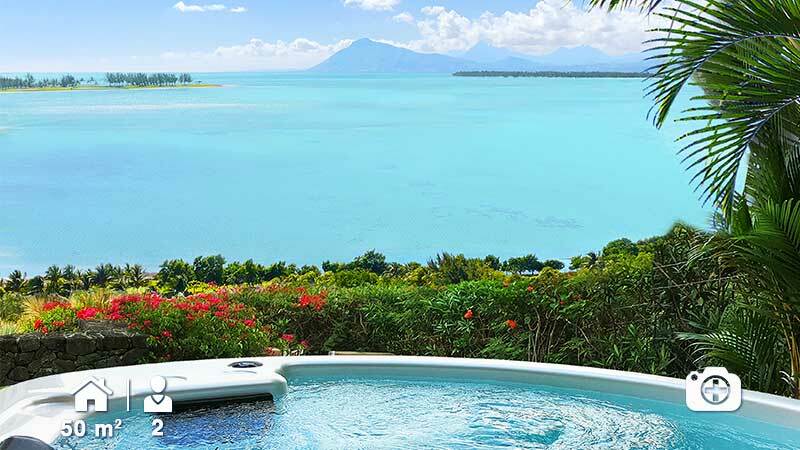 Don't miss so many of them, just make sure you reach in time to experience an explosion of colours in the beautiful sky of the west coast of Mauritius. 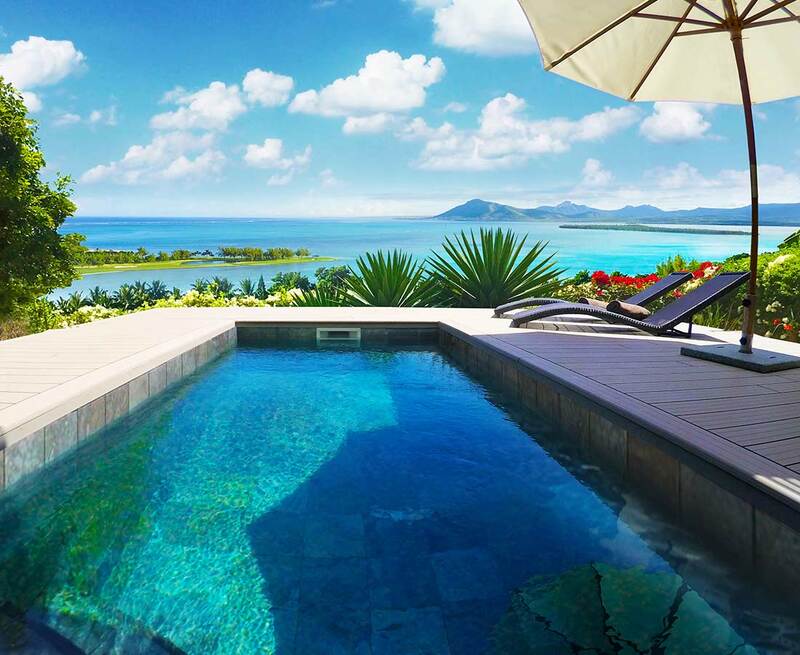 Happiness is a plunge in the pool. 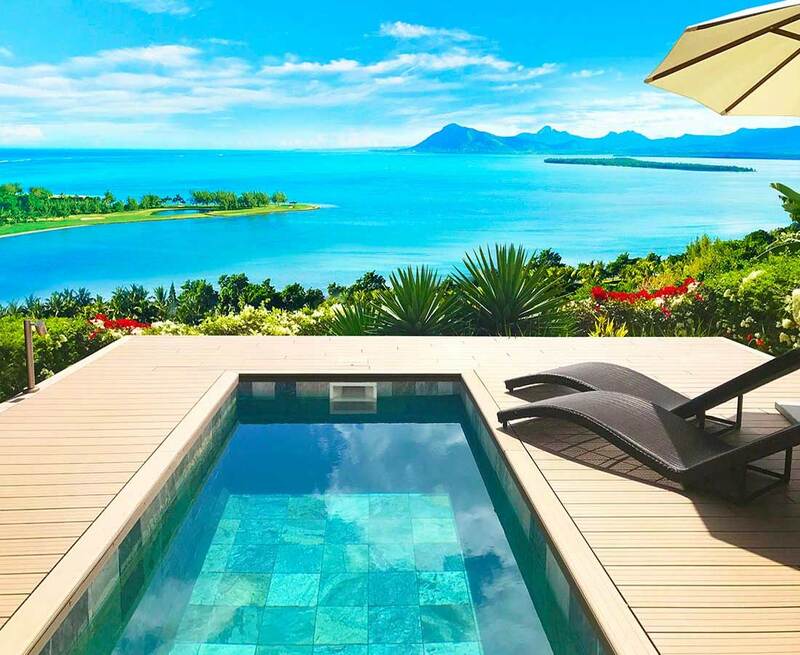 Free your mind, take your mark and swim. 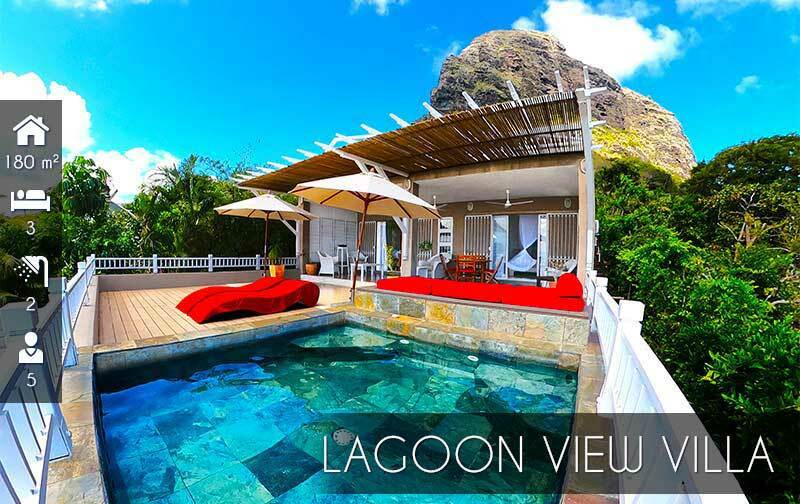 Life is awesome at Kozy Le Morne Villa. 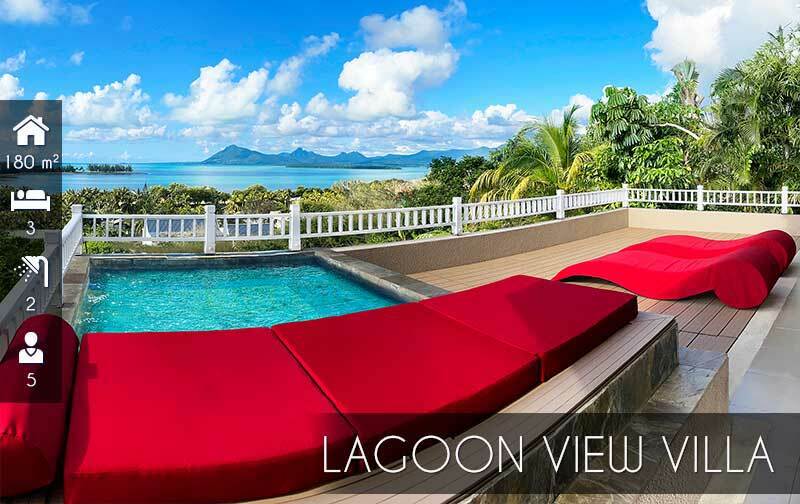 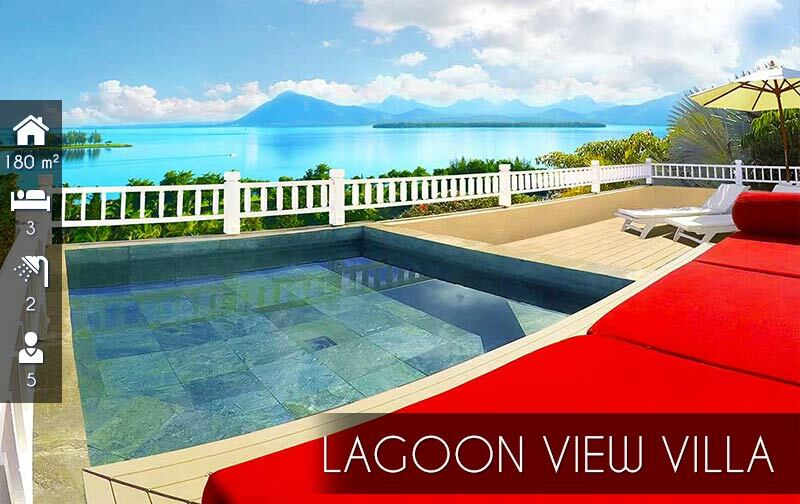 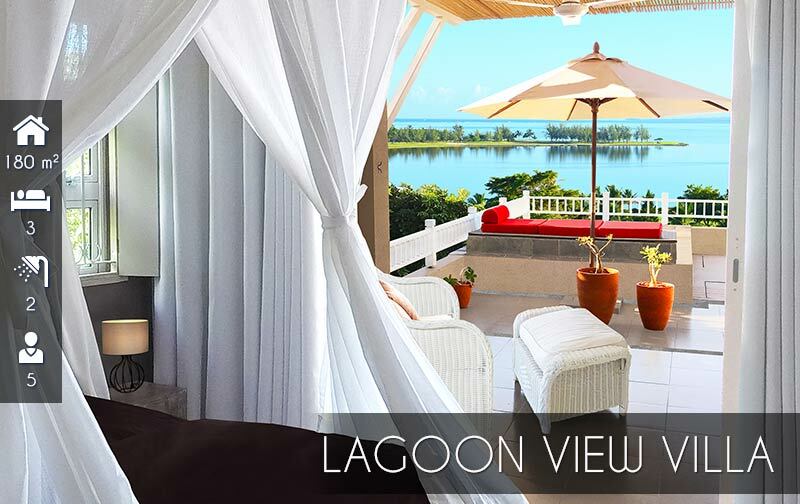 Enjoy the bliss of a private pool at Lagoon View Suite or at the Sea View Suite. 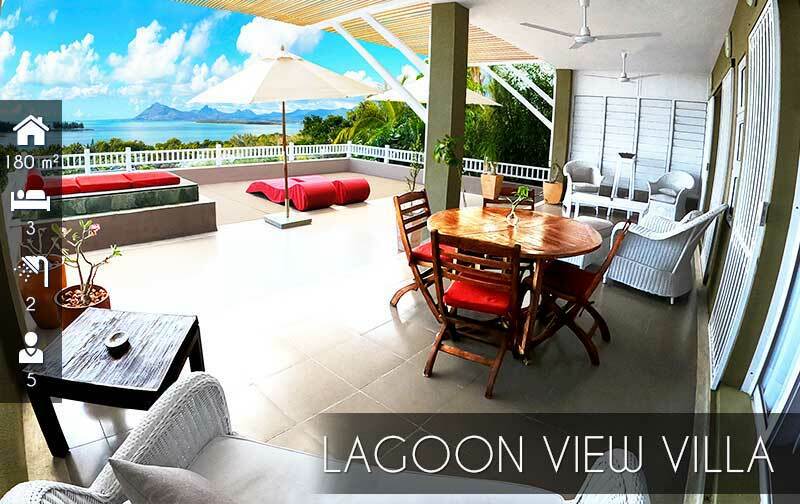 At Kozy Le Morne Villa, we paved paradise and put a parking space. 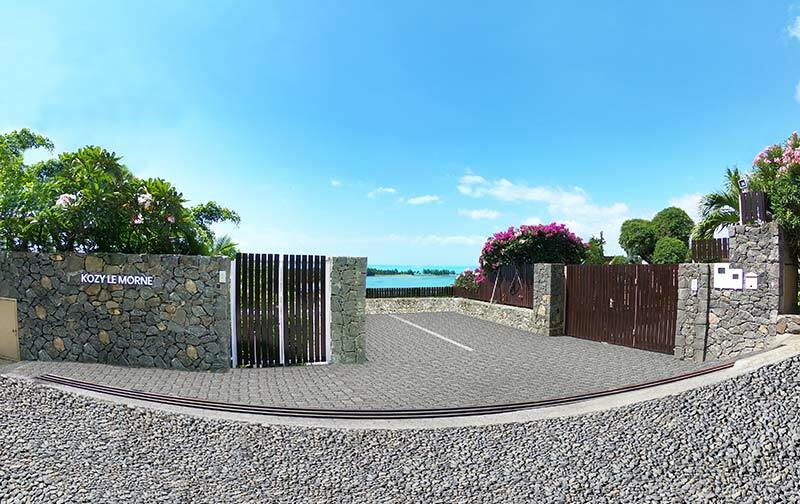 So park and walk to your access entry, locked with security doors. 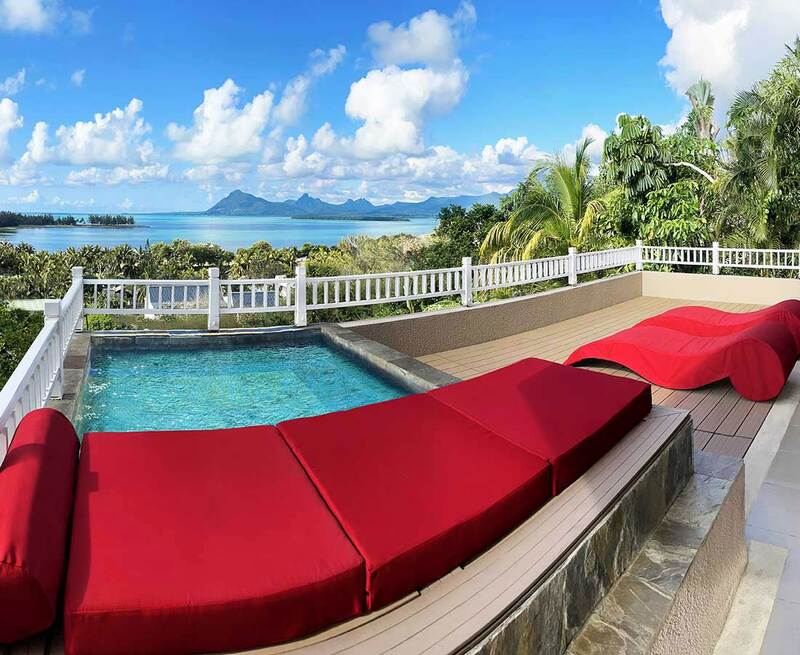 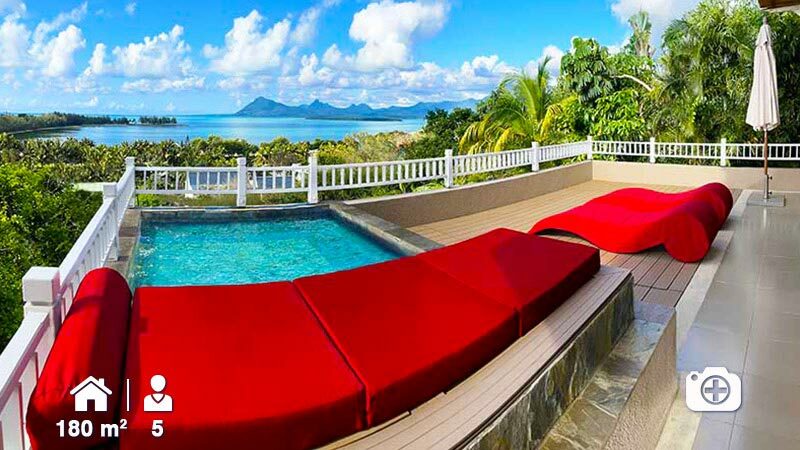 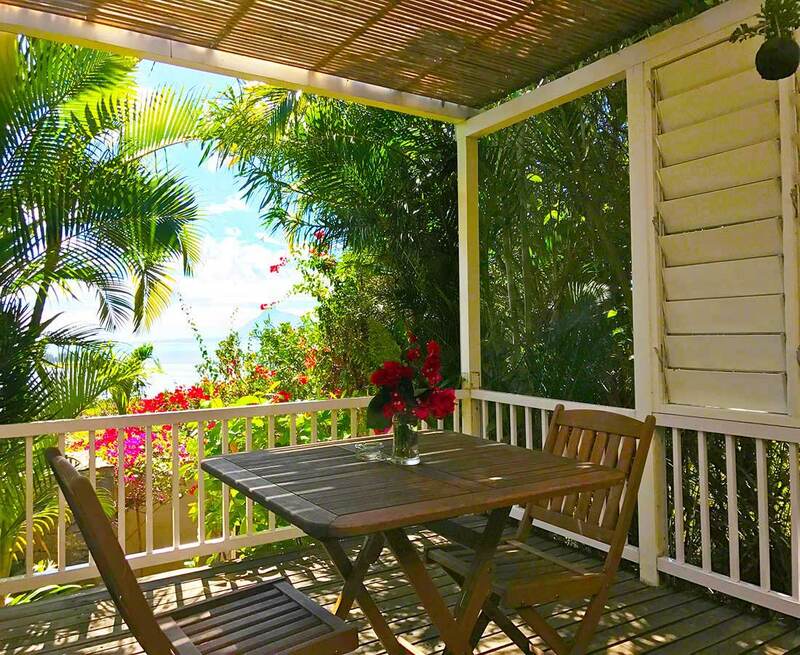 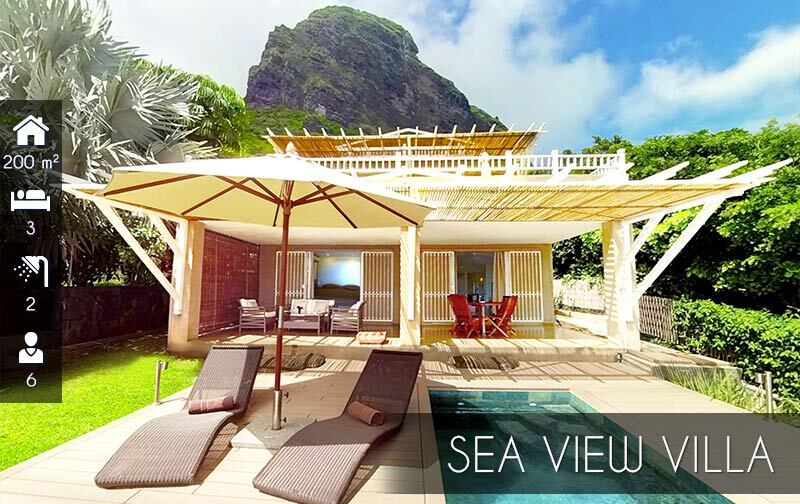 For your peace of mind, Kozy Villa Le Morne has independent access entries for the suites. 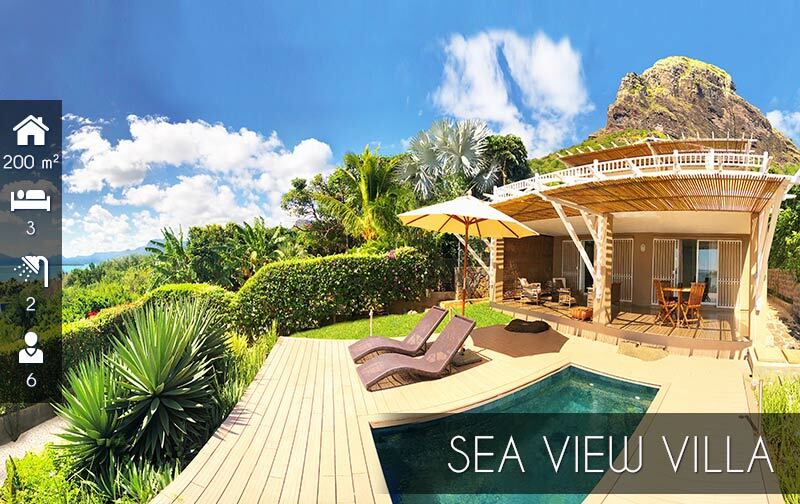 Situated beneath the legendary mountain Le Morne, Island View Suite is built on a luminous landscape, suffused with elegance. 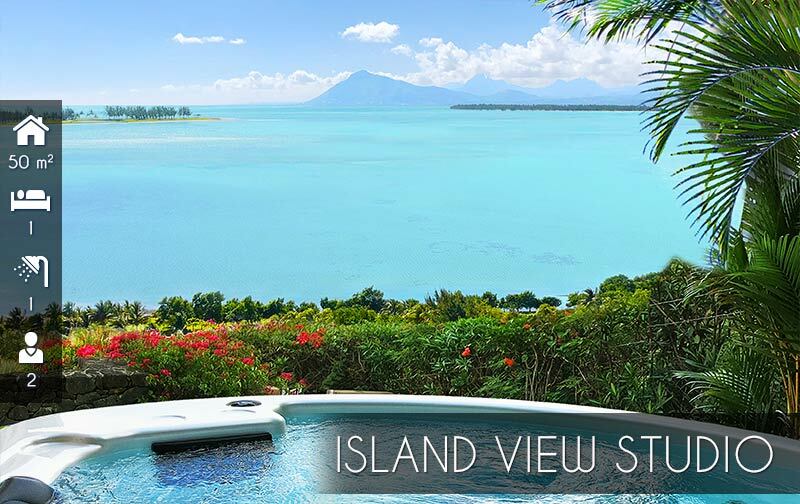 From the terrace, sit back and enjoy a spectacular view on the lagoon, La Tourelle du Tamarin as well as Bénitiers Island. 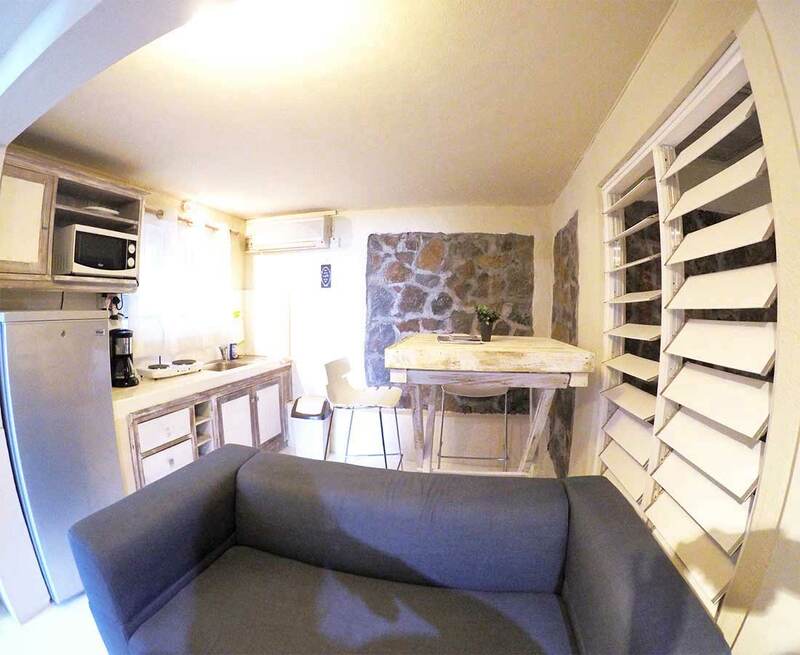 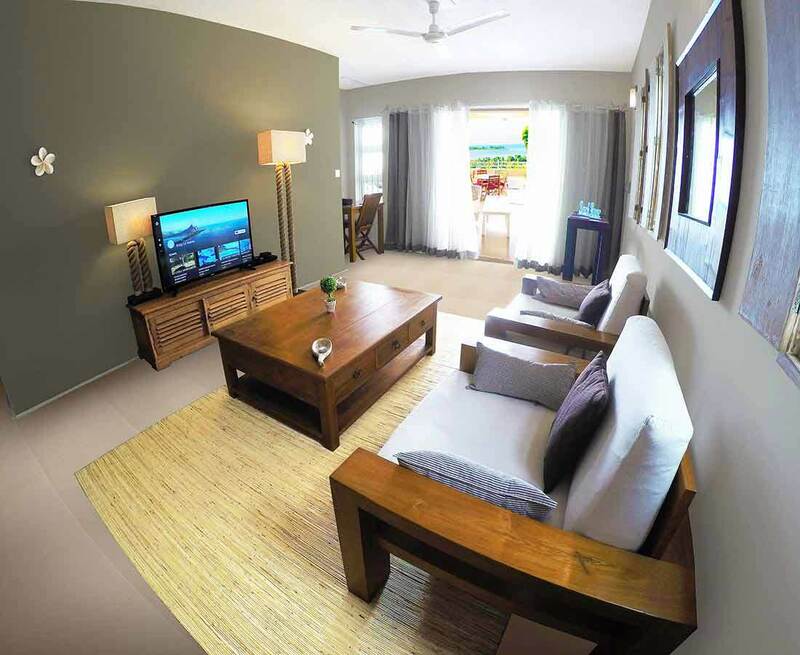 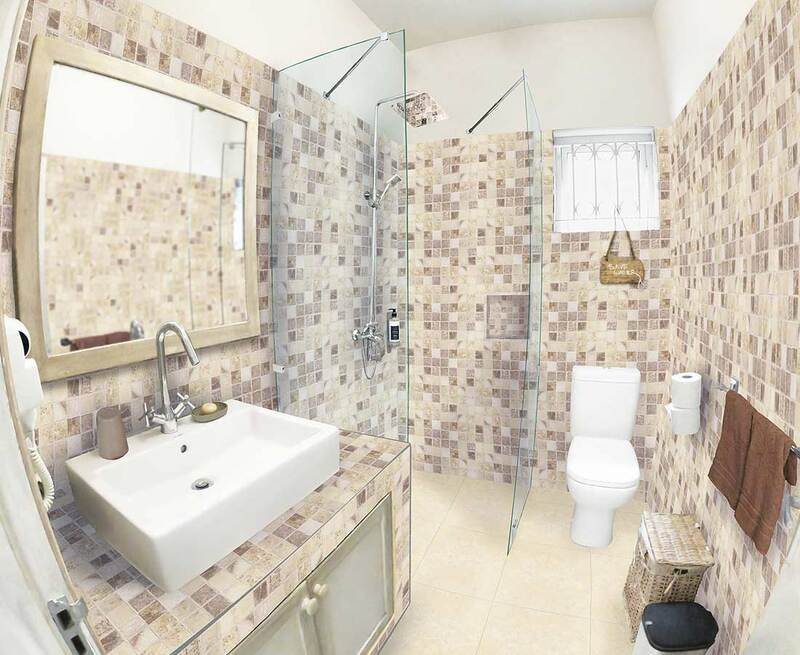 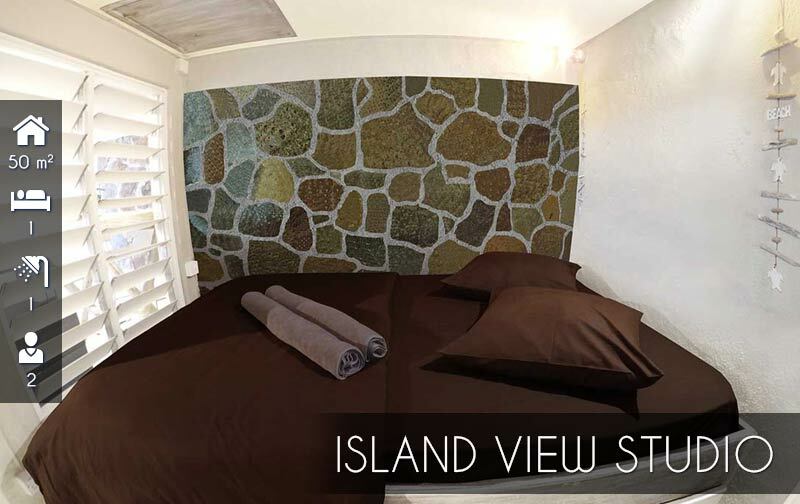 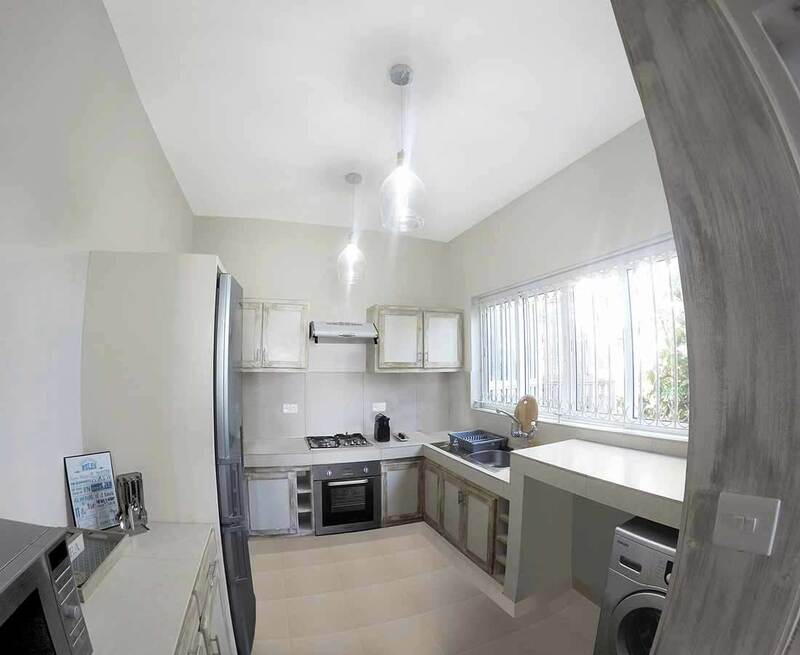 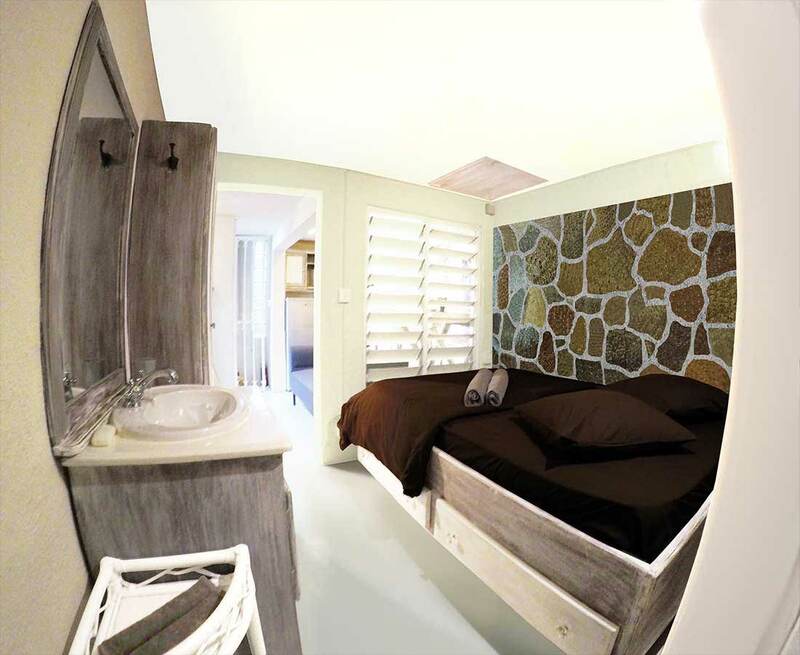 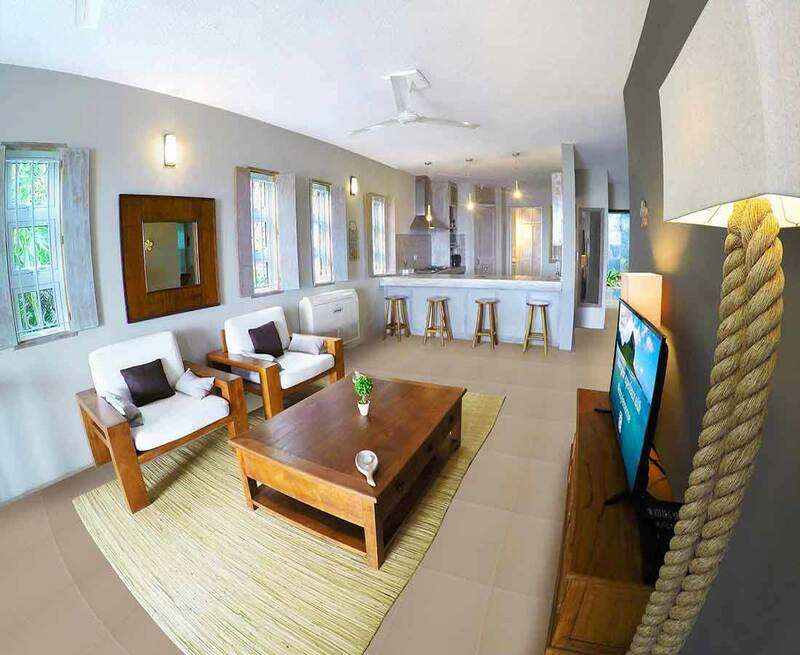 The Island View Suite has one bedroom, a bathroom, a living room and a kitchenette. 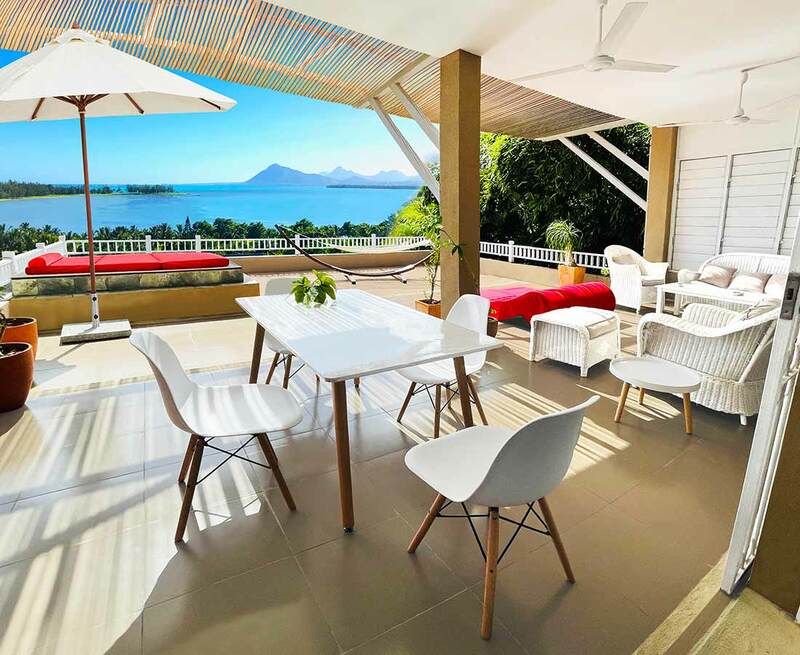 The terrace leads to a large deck equipped of a garden table with two chairs for a romantic delicious breakfast with view on the lagoon. 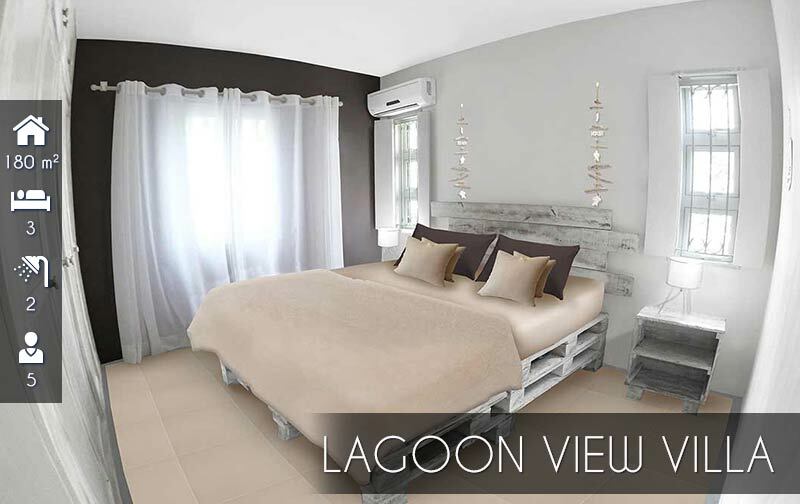 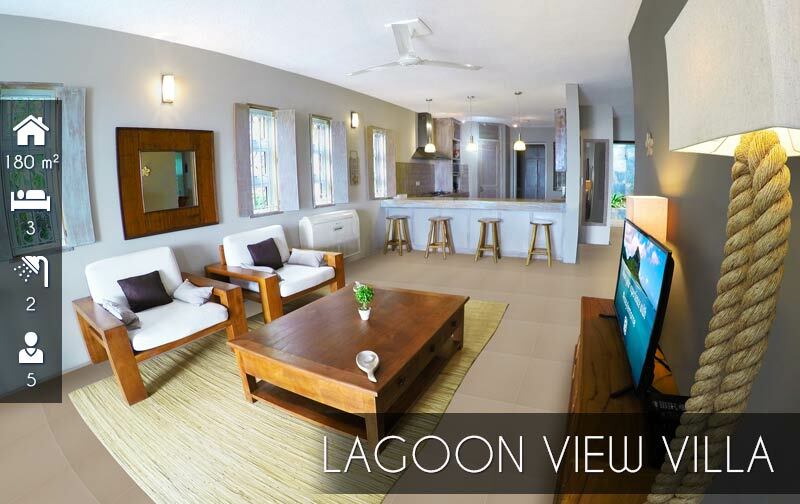 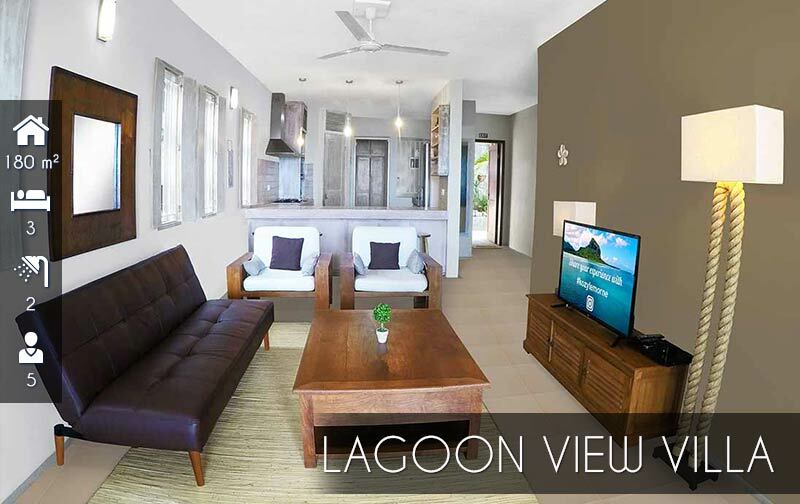 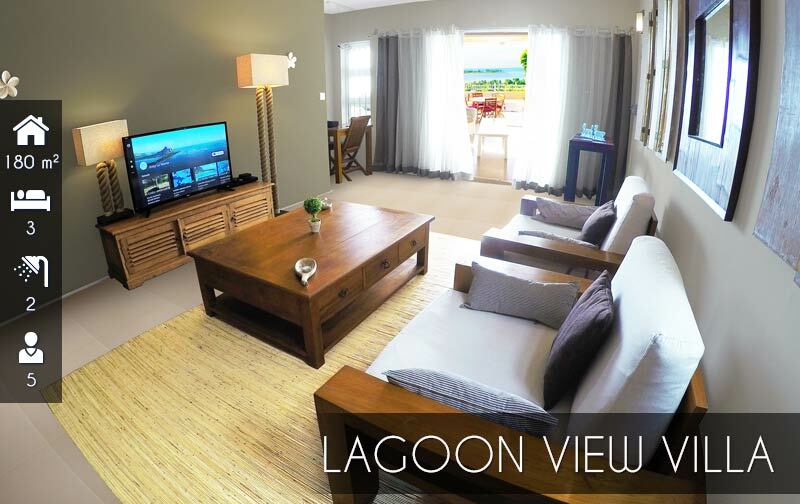 Situated beneath the legendary mountain Le Morne, Lagoon View Suite, is built on a luminous landscape, suffused with elegance. 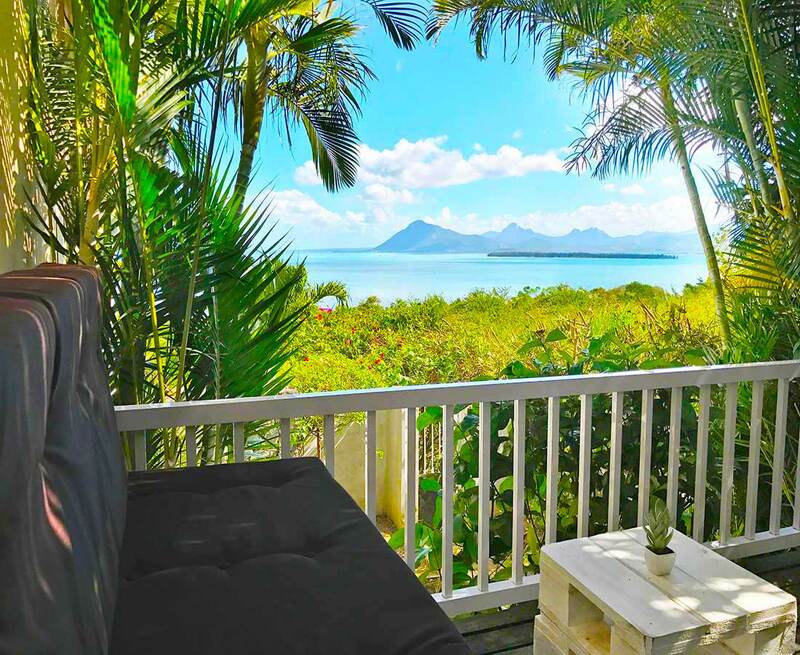 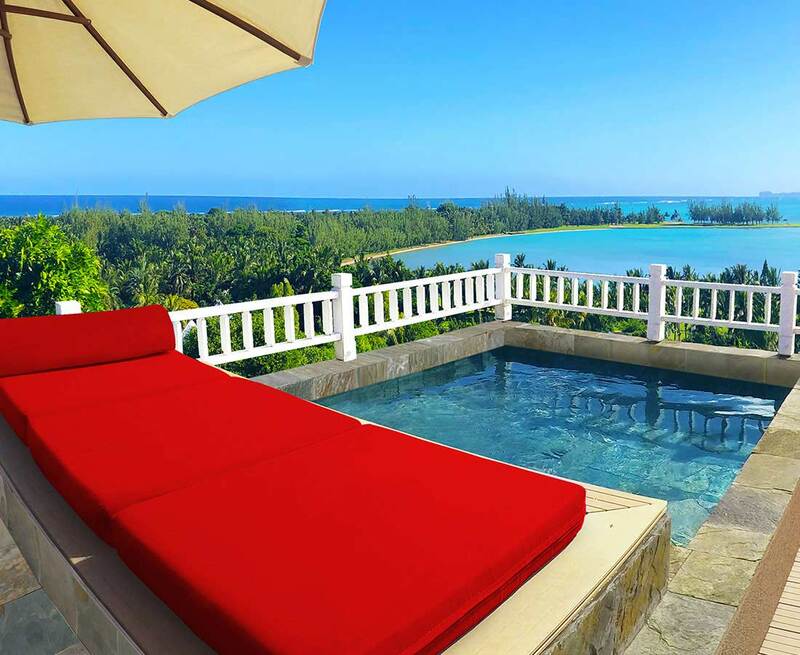 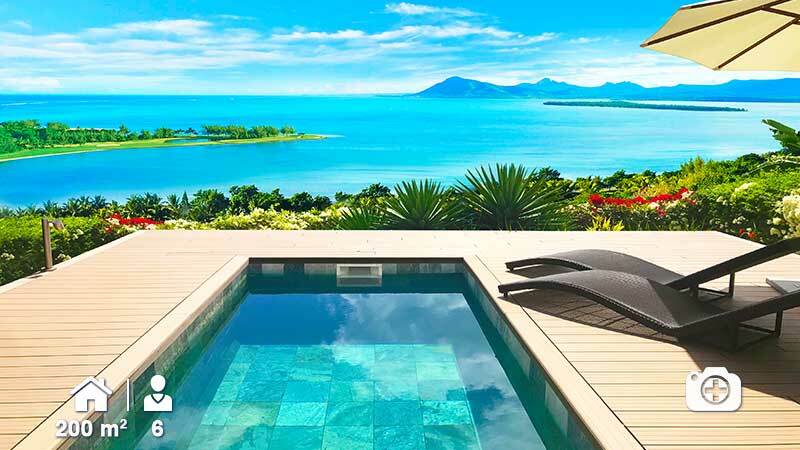 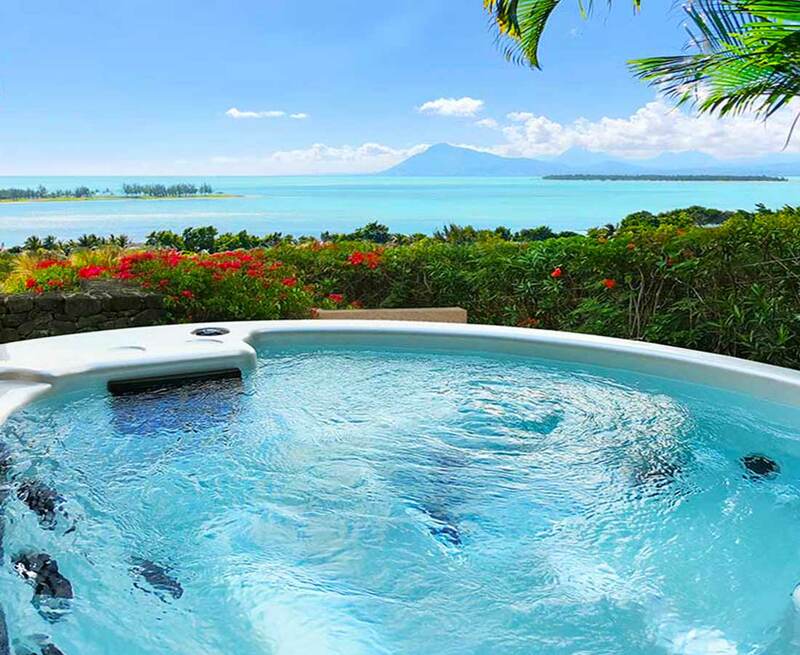 From the terrace, sit back and enjoy a spectacular view on the lagoon, La Tourelle du Tamarin as well as Bénitiers Island.The main bedroom opens on the terrace with a large deck and a private plunge pool. 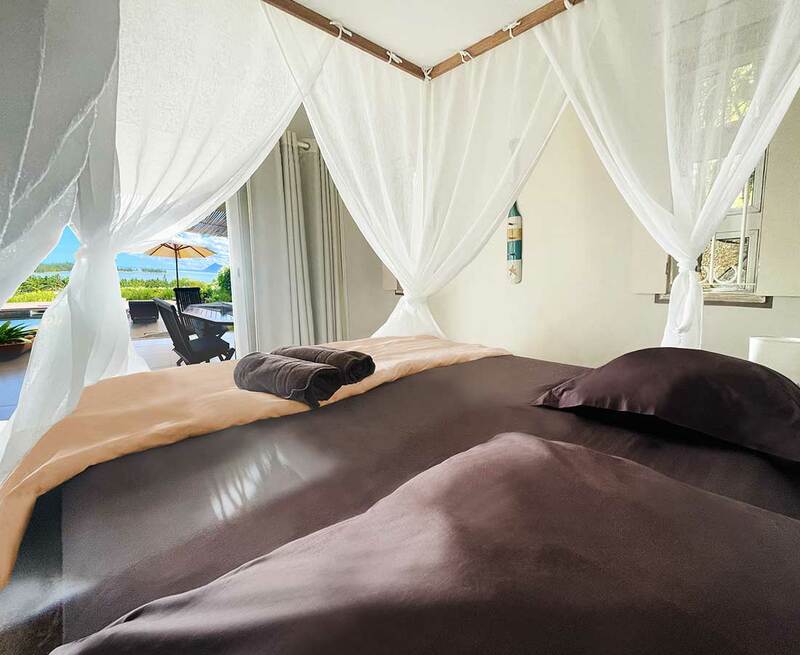 Fully furnished, this suite beautifully unfolds 2 bedrooms, 2 bathrooms and a utility room, equipped with a washing machine and a dishwasher. .
To unwind your mind, you can simply pull the curtains from the Master Bedroom and get lost in the idyllic view on the Golf course of Paradis Resort and the sea around Bénitiers Island. 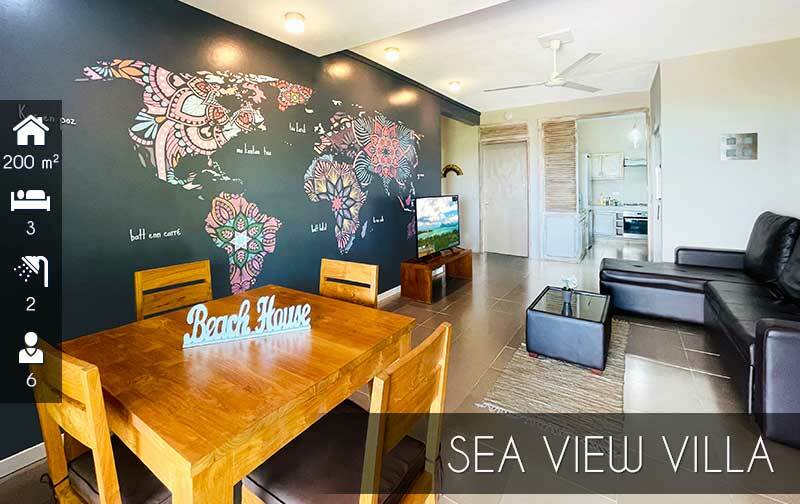 Or just walk on the terrace that leads to a large deck around the swimming pool.The Seaview Suite is fully furnished with 2 bedrooms, 2 bathrooms and an equipped kitchen with a refrigerator, a microwave, a gas oven, a coffee maker as well as a washing machine. 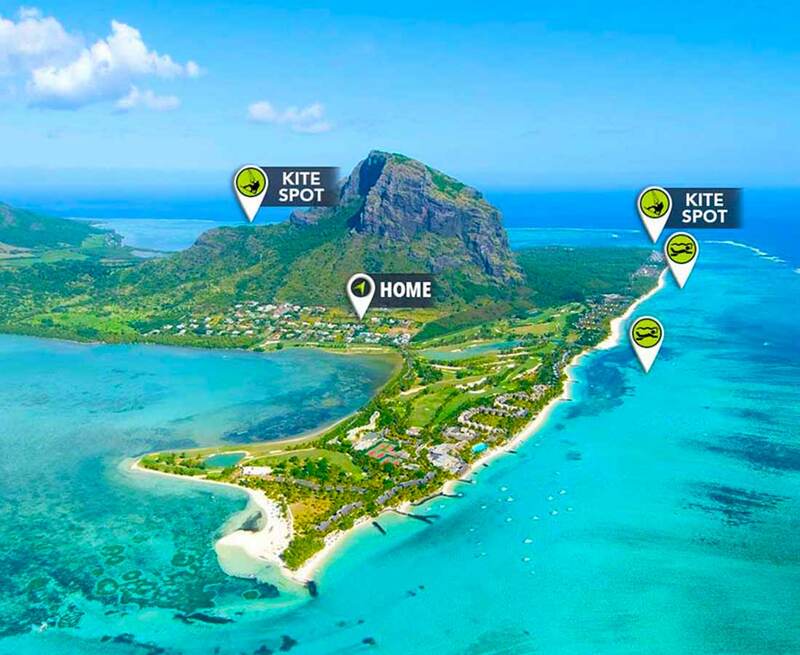 Plan your Kite Trip : with 300 days of winds per year in Mauritius, Le Morne is one of the best spots for kitesurfing. 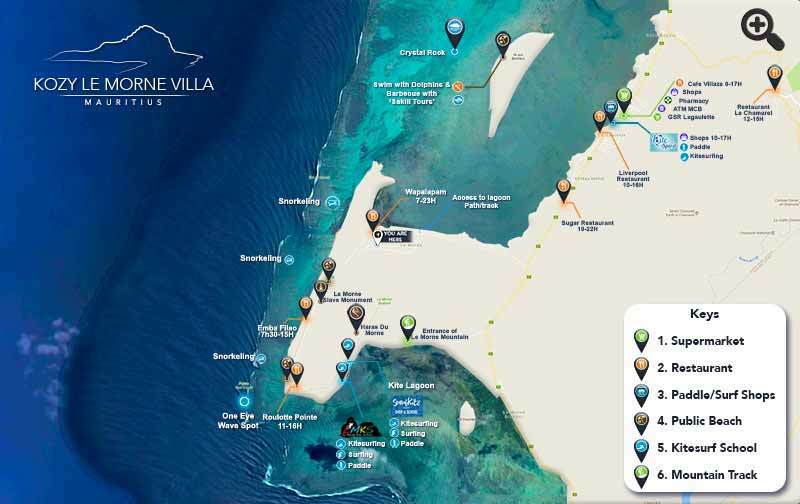 The Kite Lagoon spot is a must for kitesurf lovers & professionals of this amazing water sport. 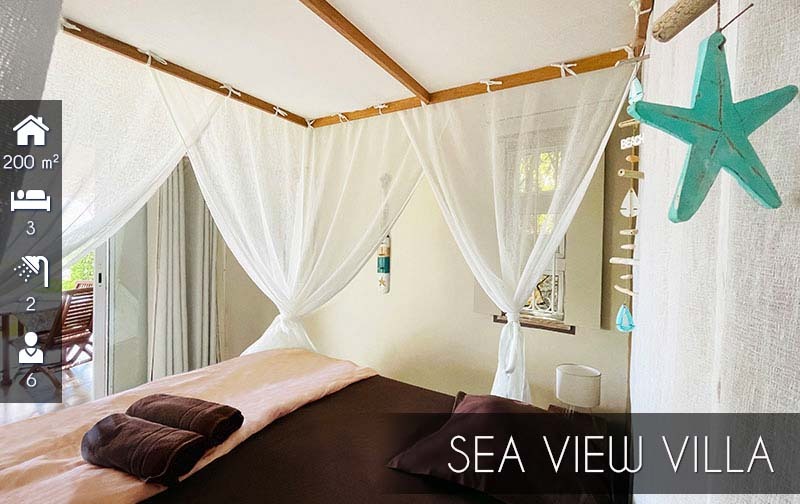 Kozy Le Morne Villa is situated at only 2 km from the spot which is 3 mins by car . 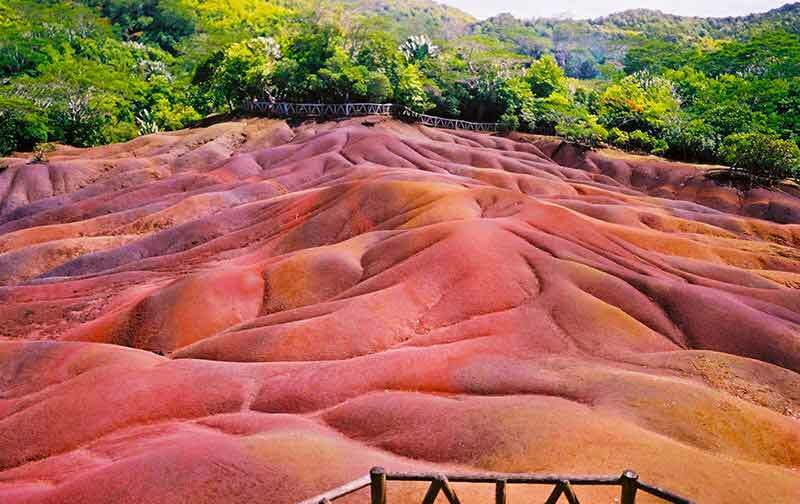 Add 7 Coloured Earth to Your Experience : it is said that the different colours of the earth are caused by decomposed basalt gullies, turned into clay. 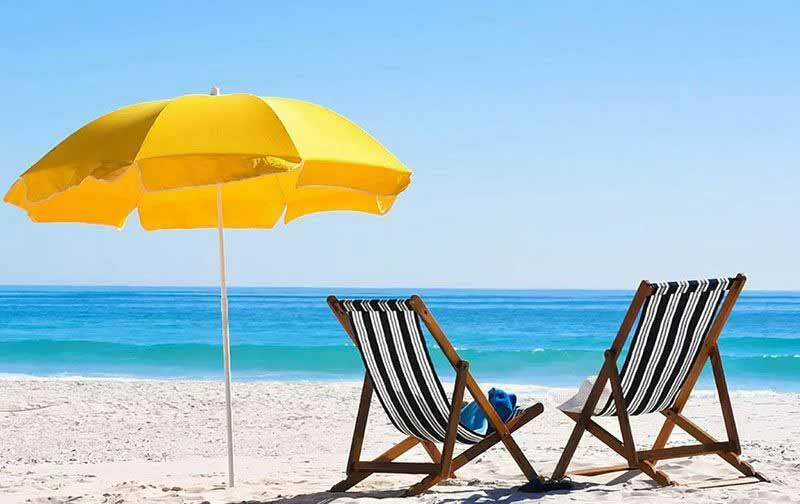 Mix the colours together, you will be amazed to see that they will separate on their own. 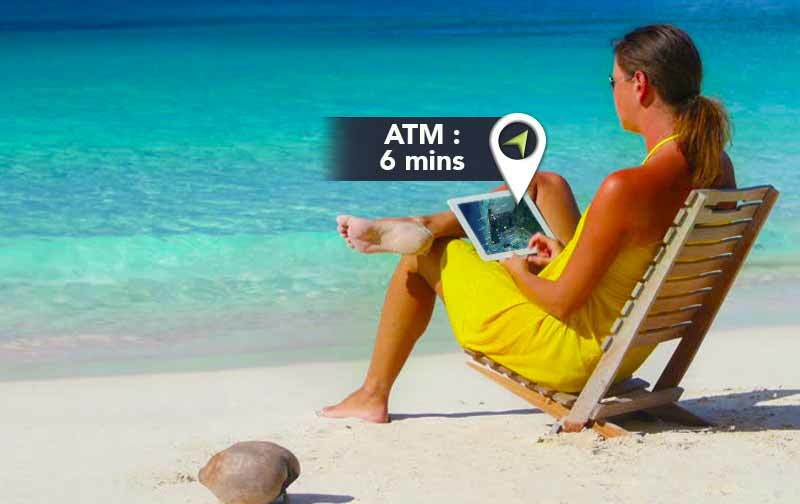 Worth a try, just rent a car and do it ! 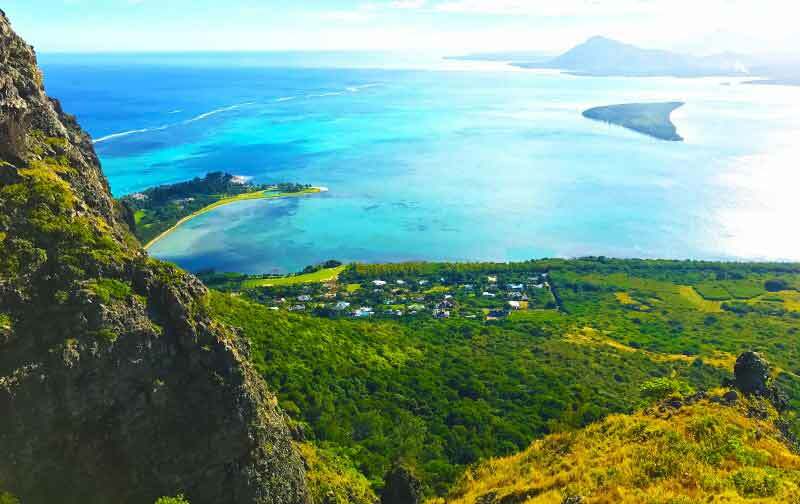 For a memorable Underwater Waterfall Sightseeing : Just off the coast of Le Morne, on southwest of Mauritius, the Lagoon offers a spectacular illusion. 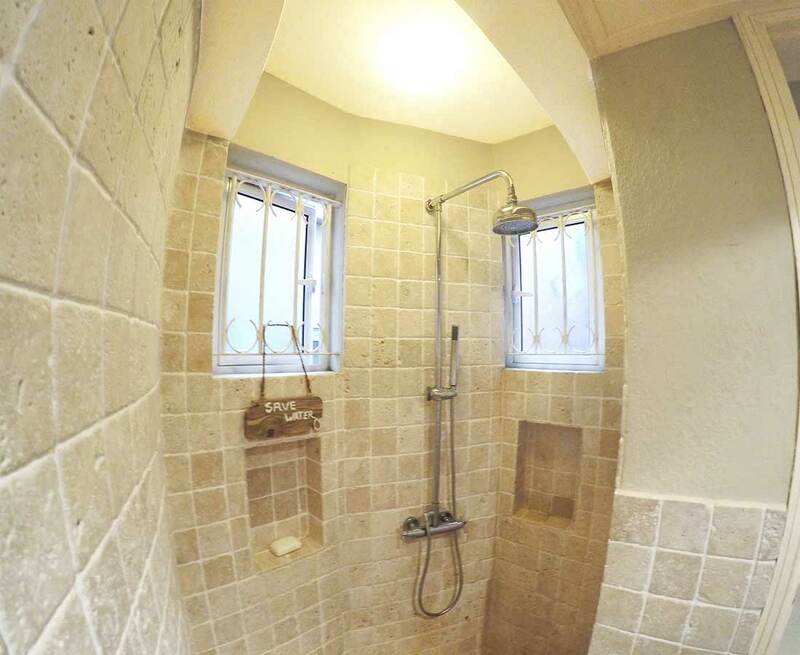 Sand and silt on the ocean floor run off in a way that makes it look like they're pouring down a waterfall. 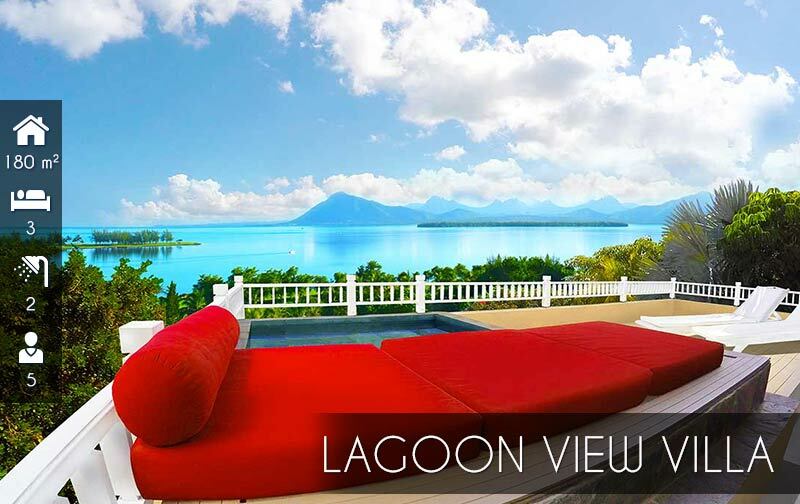 It is considered a true wonder not to be missed. 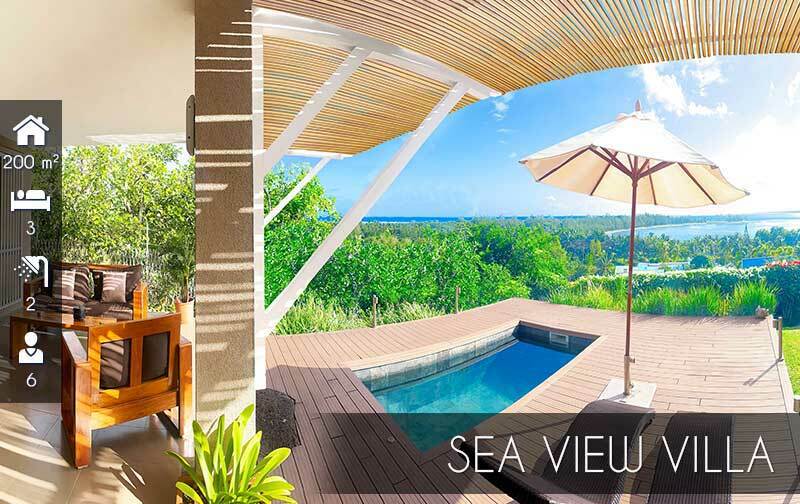 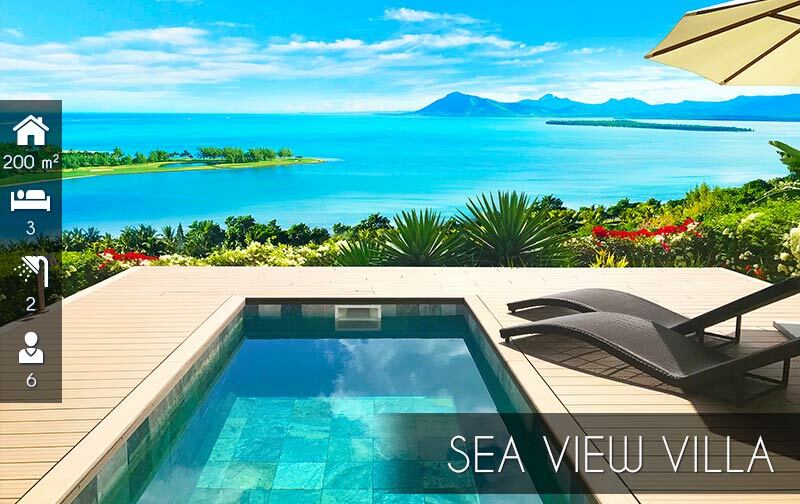 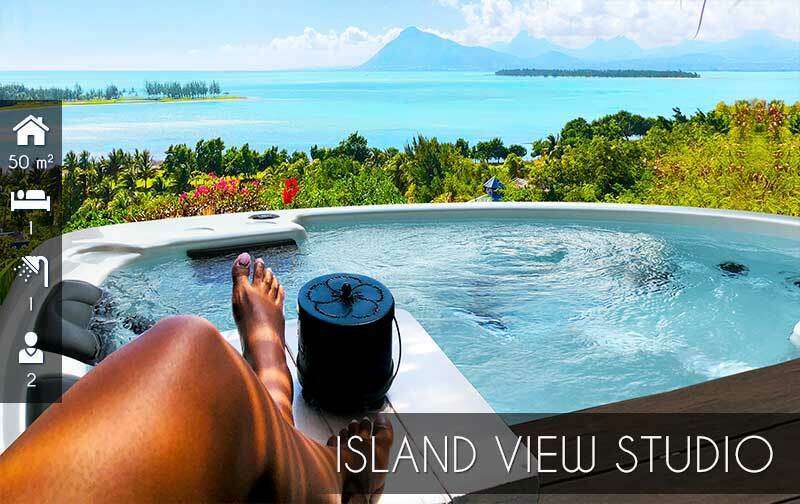 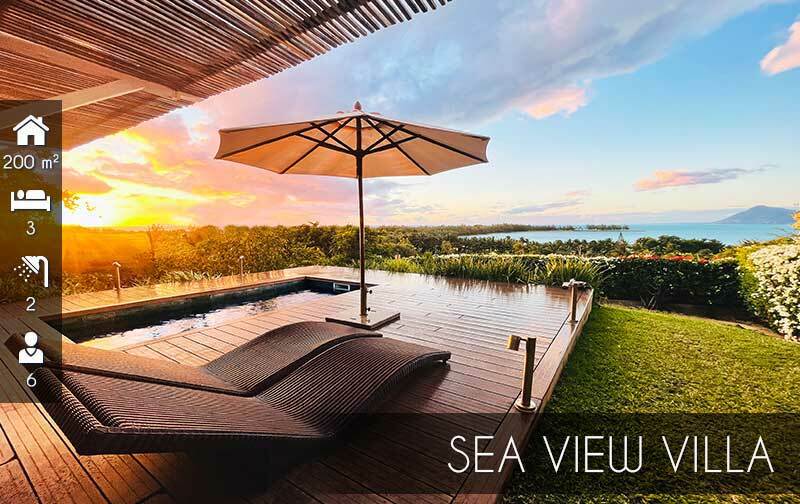 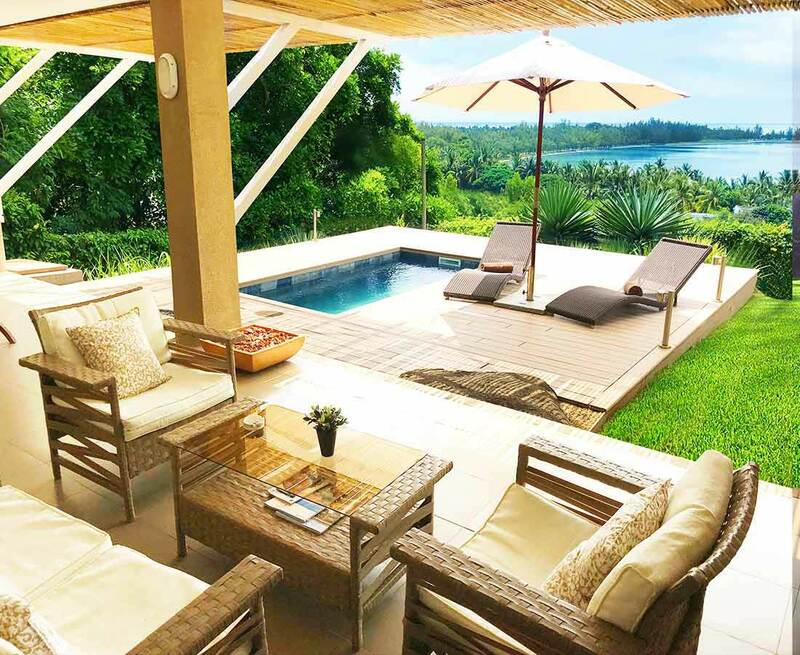 Not to Miss the spectacular view : from your deck lies the panoramic sea with the Benitiers Island by your right and the crystal rock in front giving you a spectacular view which make you dream. 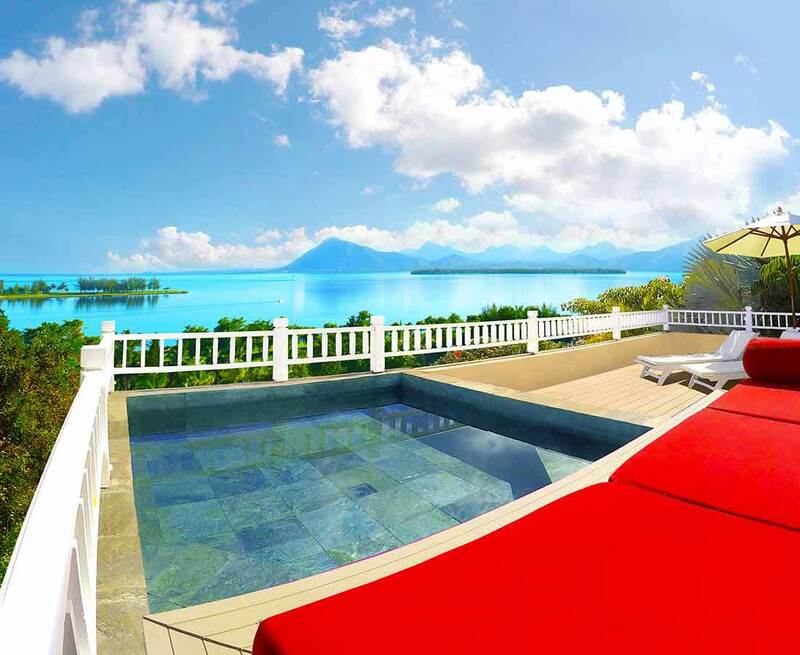 You wake up in the morning with the endless blue of the sky and sea which unravels in front you. 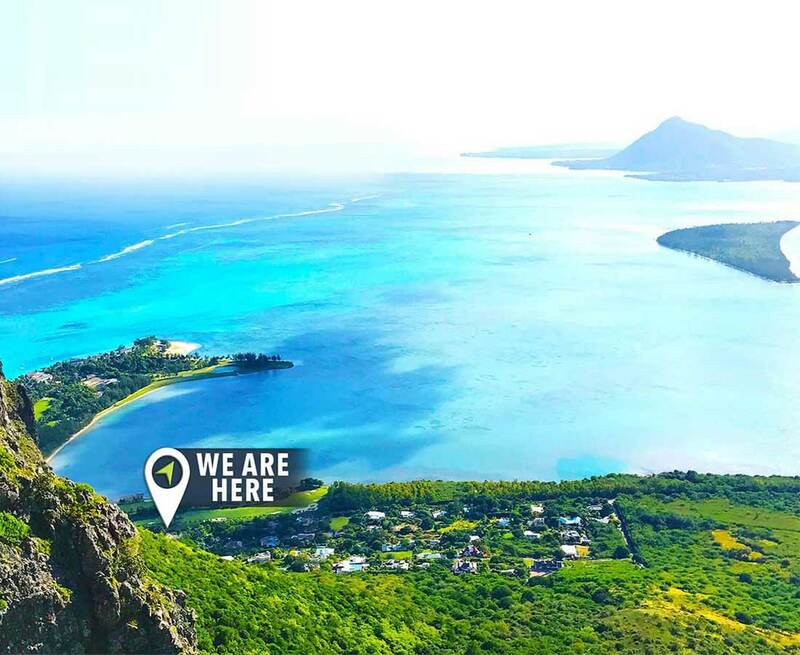 Conquer the Climb : Rising over 556 metres above sea level, the magnificent high point offers breathtaking and flawless views on Mauritius’ nature sceneries. 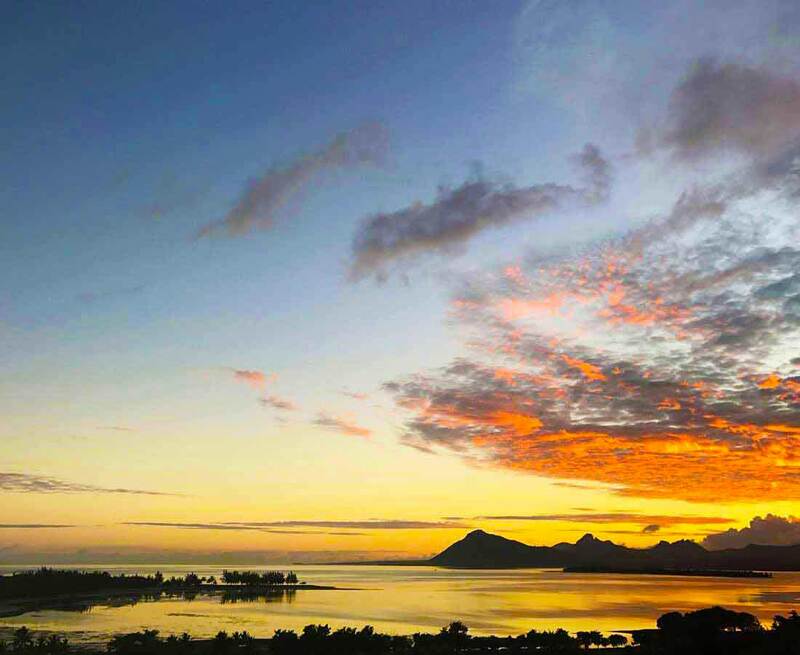 A natural sanctuary with high symbolic value about the resistance to slavery, Le Morne Brabant has been acknowledged as a World Heritage Site by UNESCO. 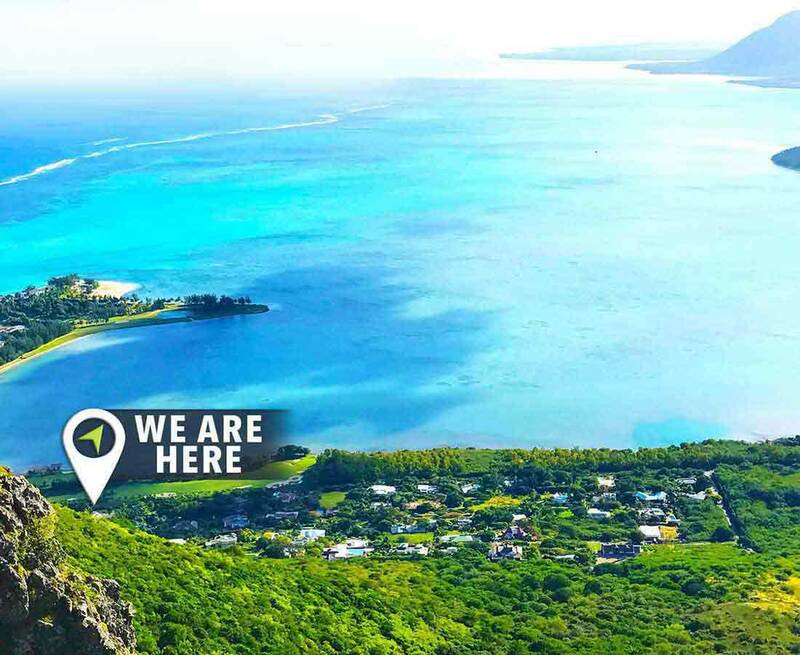 Now known under the name of « Paysage Culturel du Morne » its access is open to the public and hike lovers. 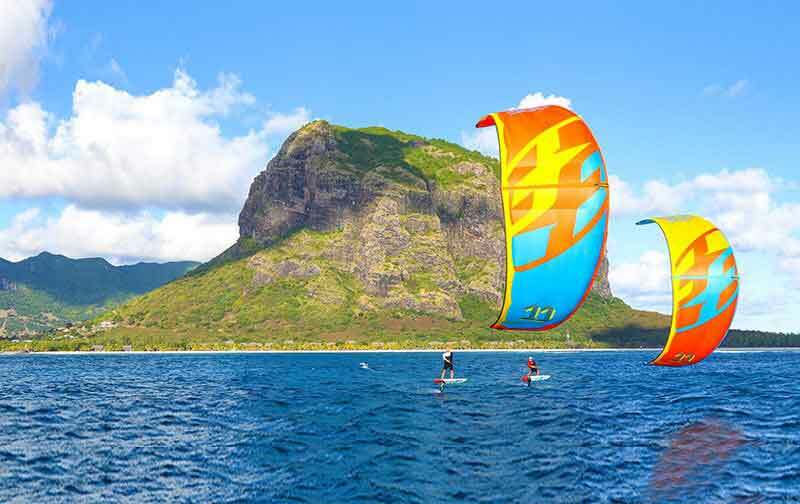 If you need vitamin sea : just walk or drive to Le Morne Beach, one of the best in the island. 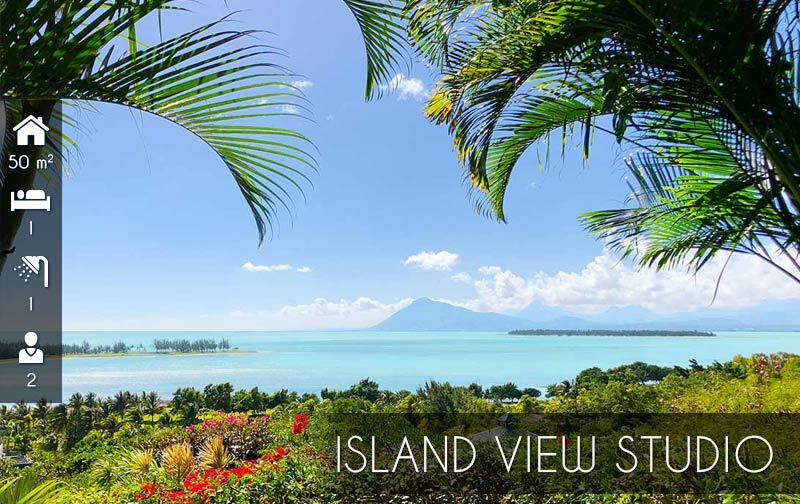 It distinguishes itself with an overshadow of its historical mountain, offering at the sametime a wide expanse of white sand for a romantic walk at dawn or at dusk, with a paradisiacal setting during sunsets. 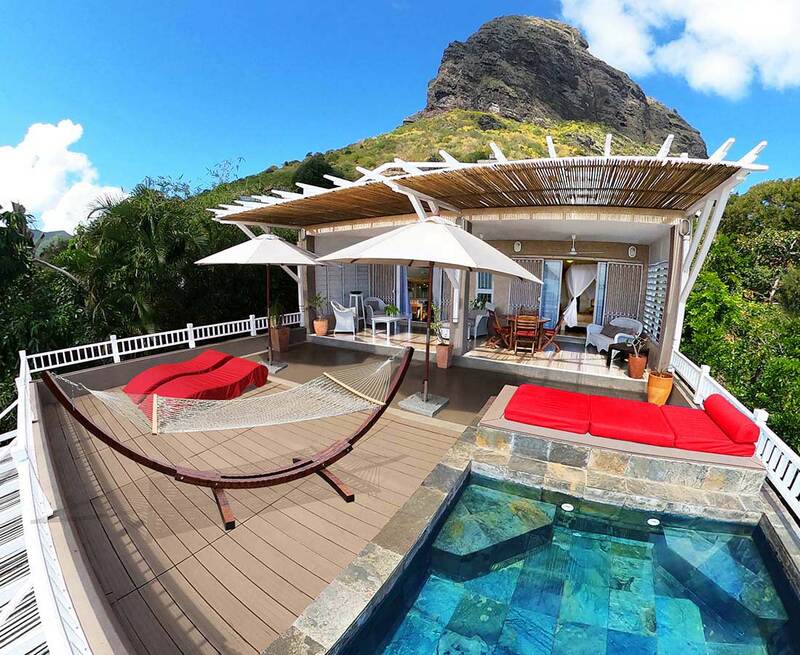 "Formidable! 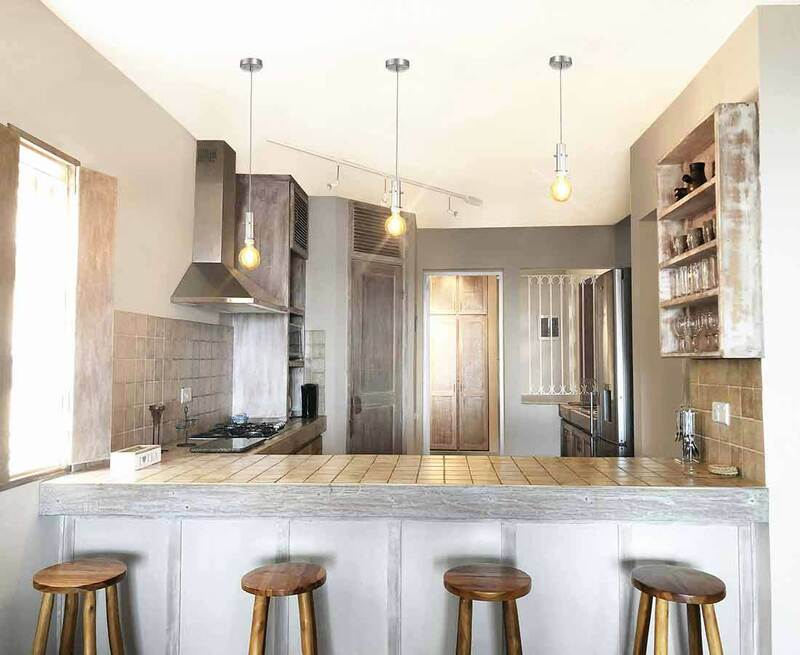 Accueil chaleureux franco-mauricien, un beau mélange. 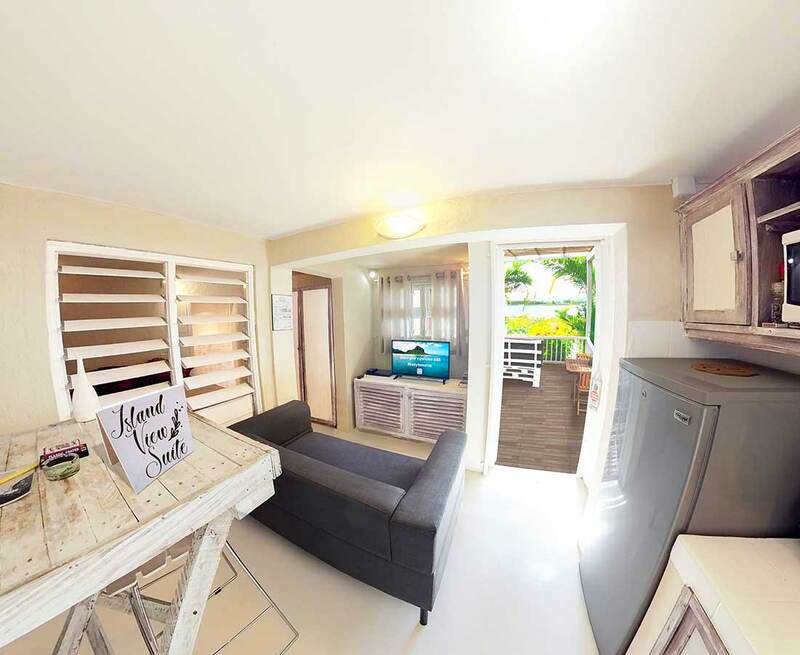 Logement à la décoration soignée, tout confort, vite approprié! 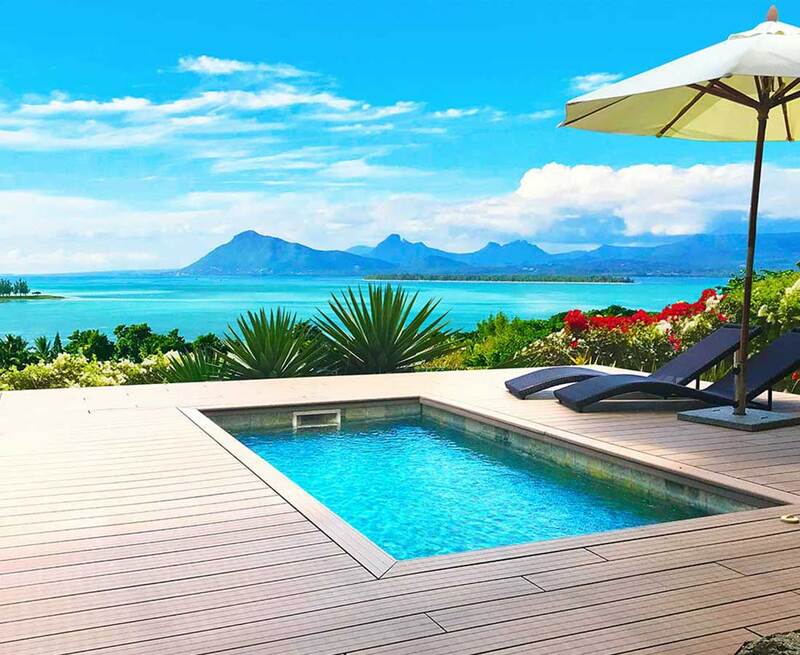 Une terrasse bien aménagée et donnant sur une vue tout simplement superbe..."
"Wir hatten eine tolle Zeit auf Le Morne. 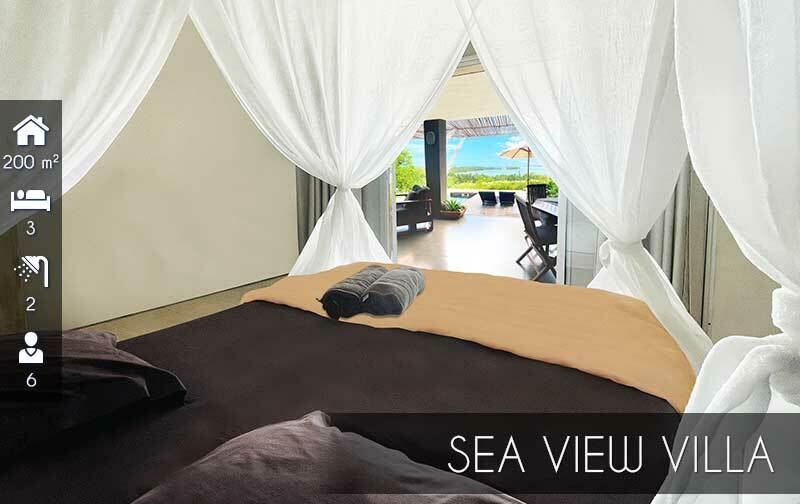 Was für ein Ausblick! 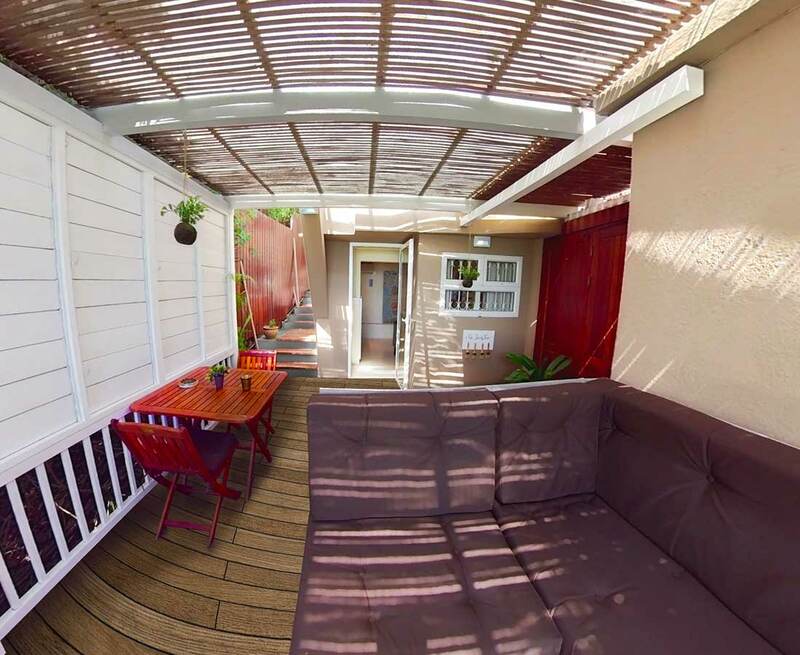 Eric war ein sehr sympathischer und zuvorkommender Gastgeber." 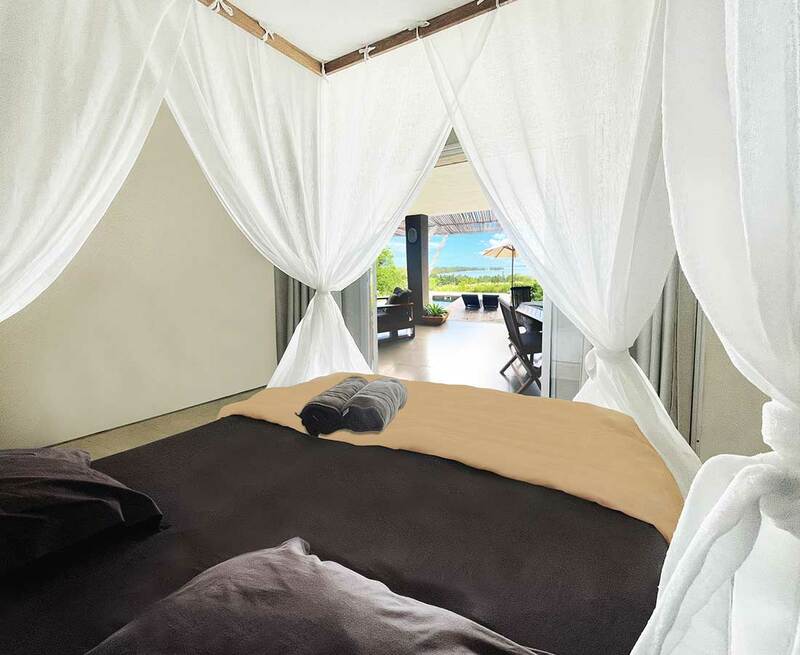 "Staying here was super! 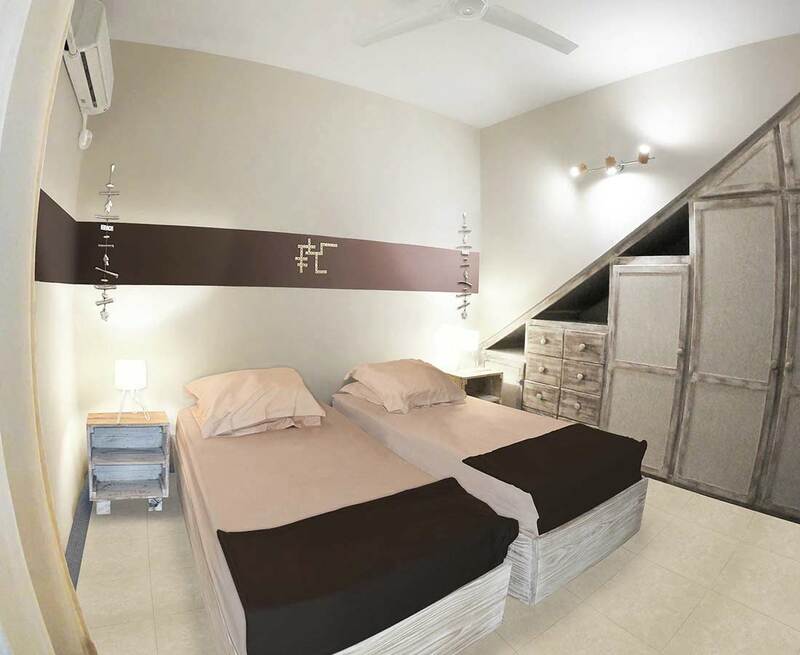 The hosts Ornella & Eric are nice and helpful. 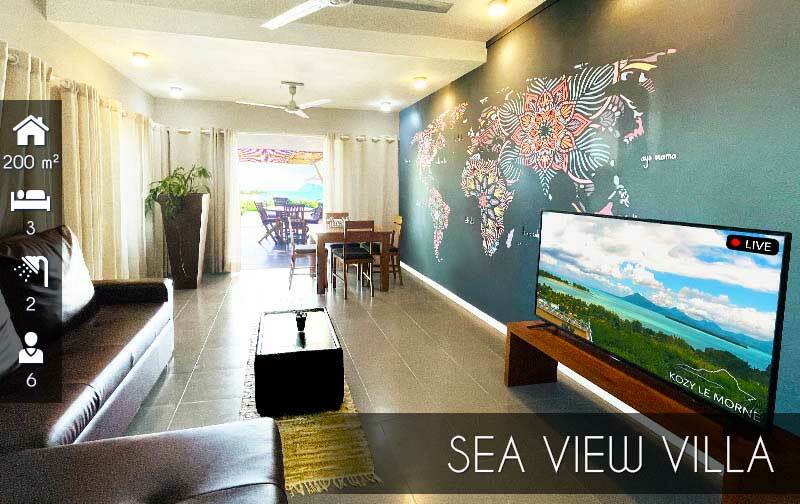 The apartment is nicely decorated and well equipped. 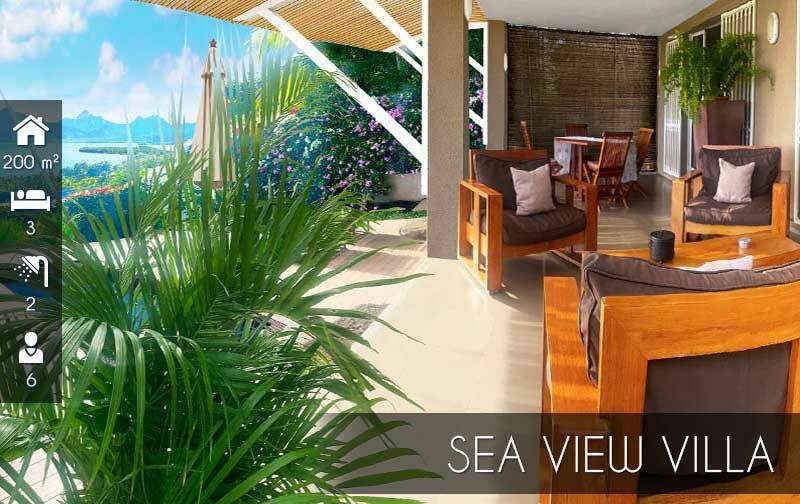 What makes the apartment unique is its superb ocean view from the deck, terrace, living room and main bedroom. 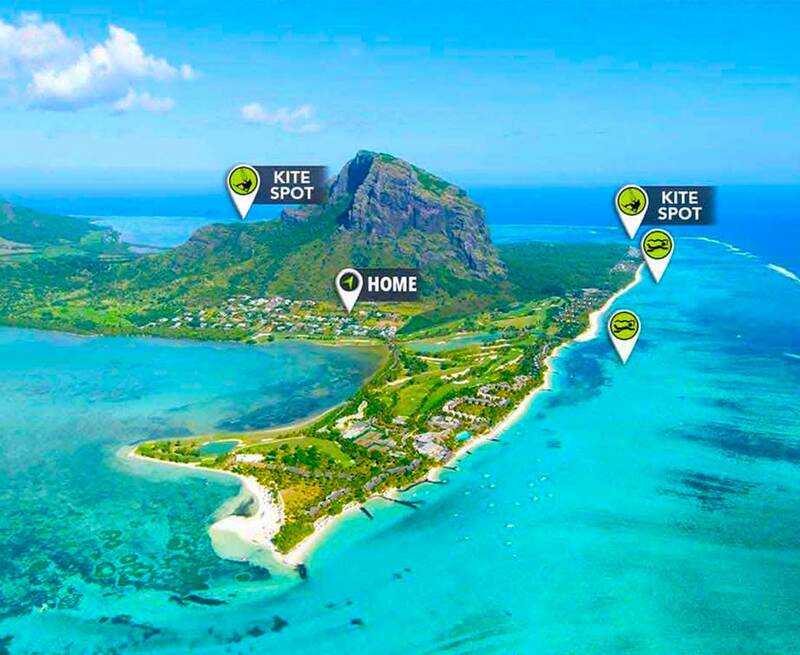 Location is ideal for kiters." 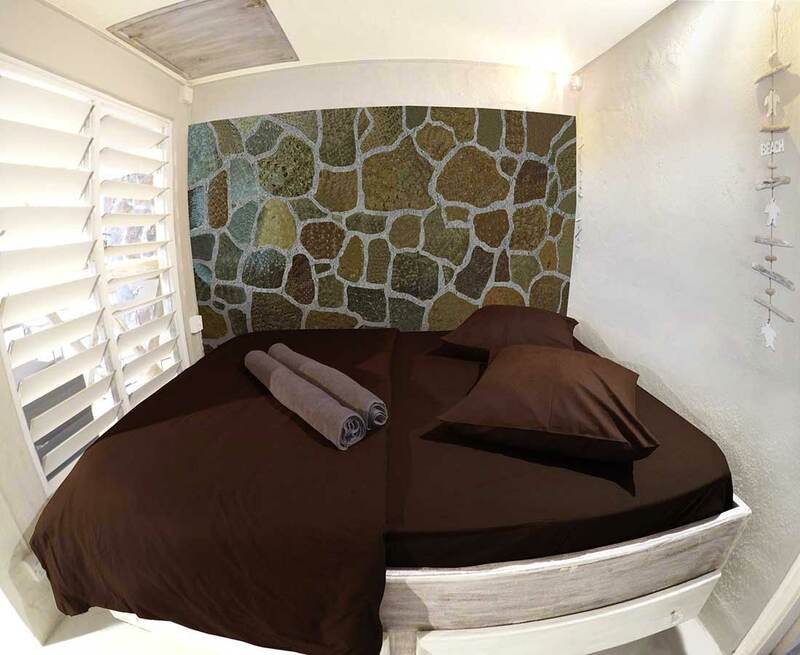 "Ornella and Eric are really nice hosts. 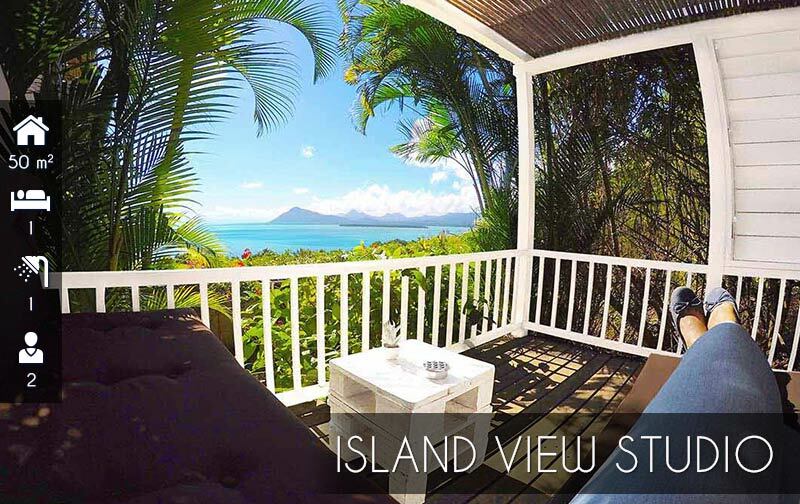 The location is great, the beach is in walking distance and the view is amazing. 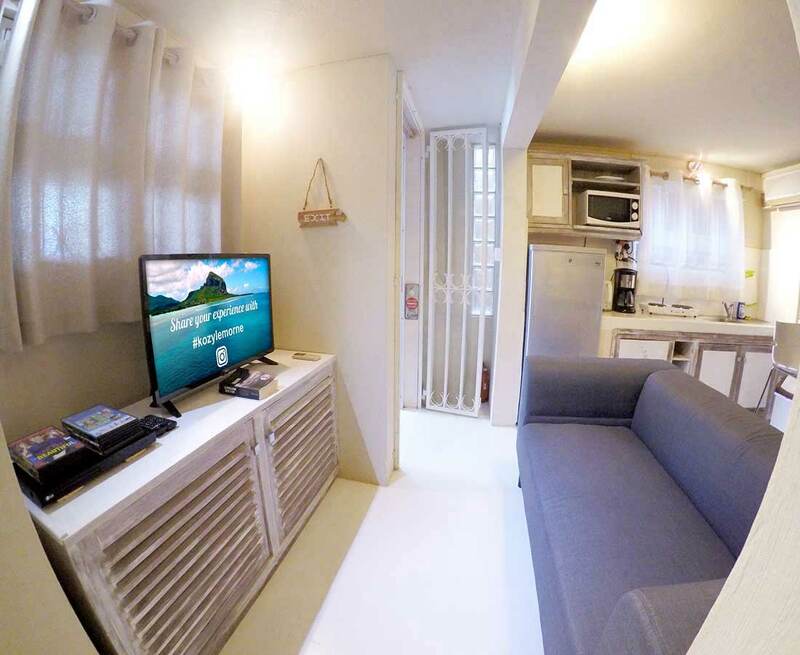 The next grocery shop and dinner restaurants are in the next village, so make sure to rent a scooter or car to get there. 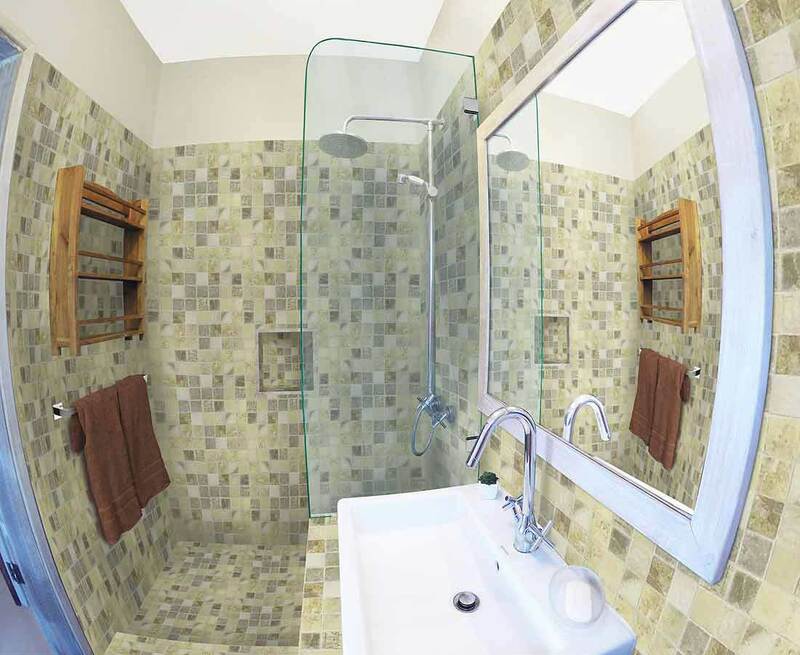 Eric is very helpful with that as well:) thanks again for having us!" 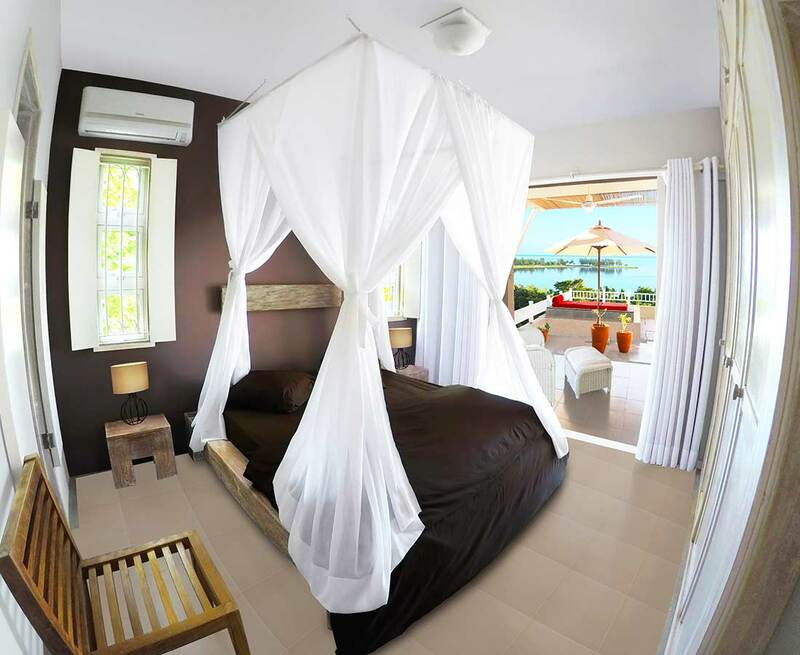 "Perfect for romantic stay and is the best position for kite Nice view and not noise at all. 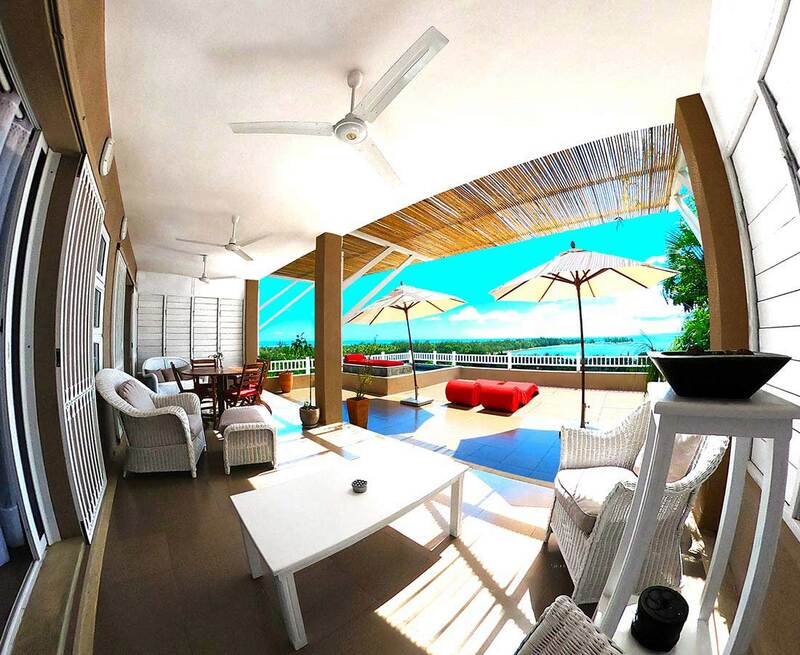 Top level apartment." 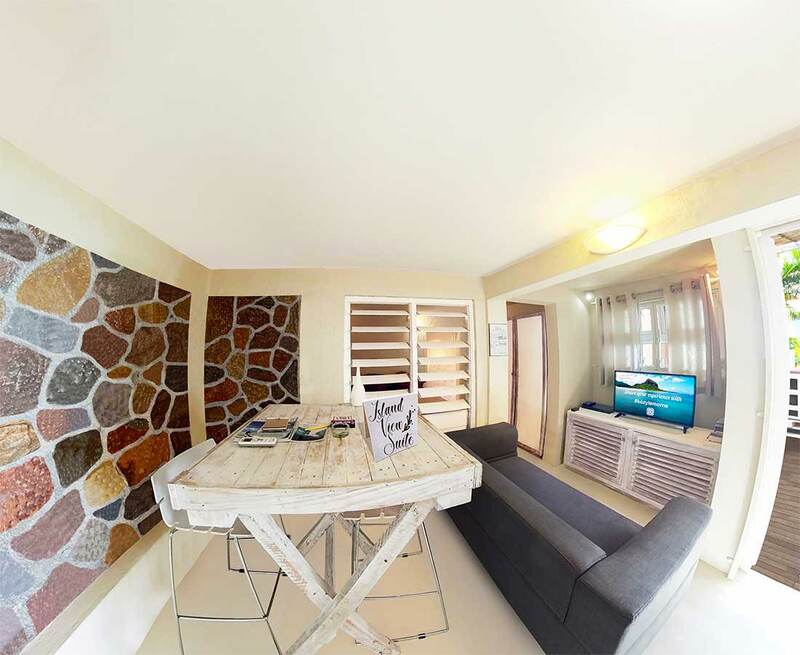 "Studio qui vaut le détour rien que pour la vue, l'emplacement et le côté très cosy, calme! 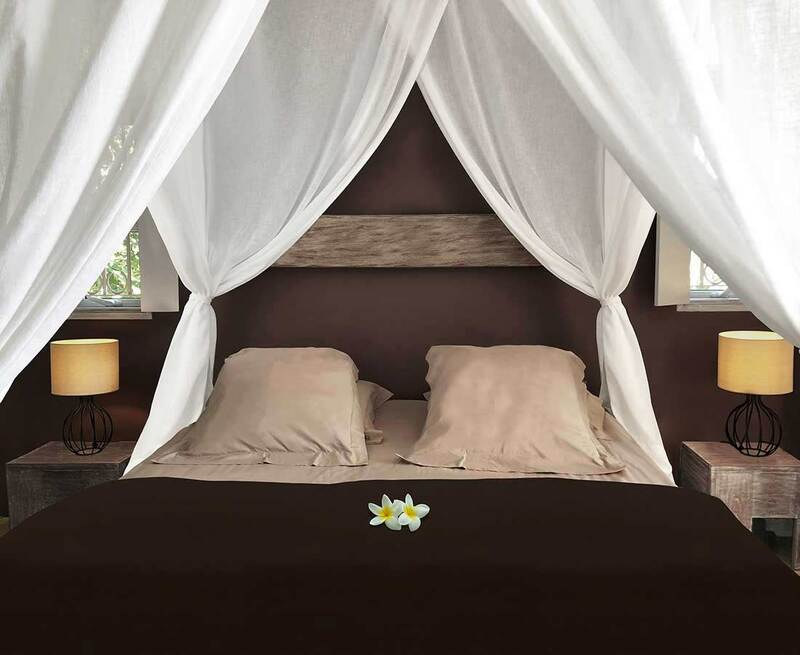 Par ailleurs Ornella et Eric sont des hôtes attentionnés et de très bons conseils! 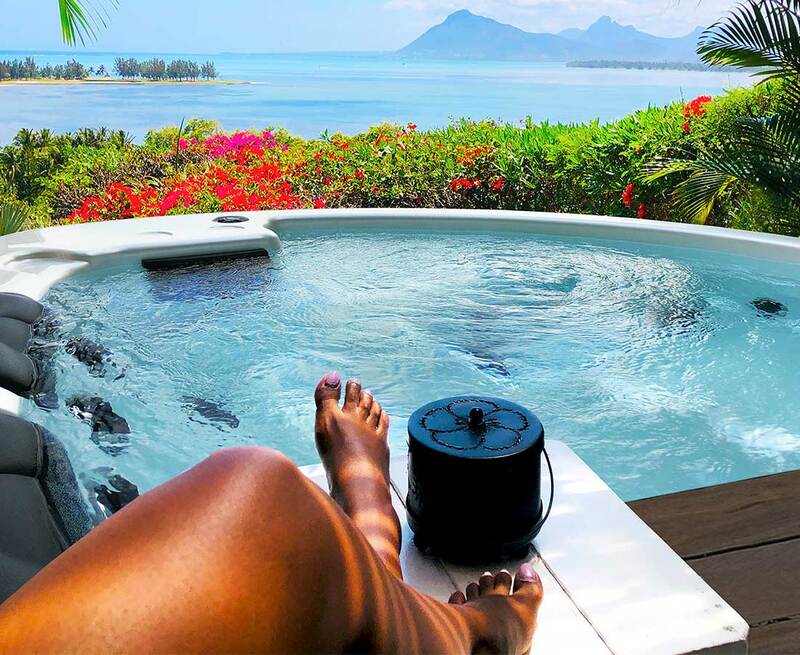 Accueil très chaleureux !" 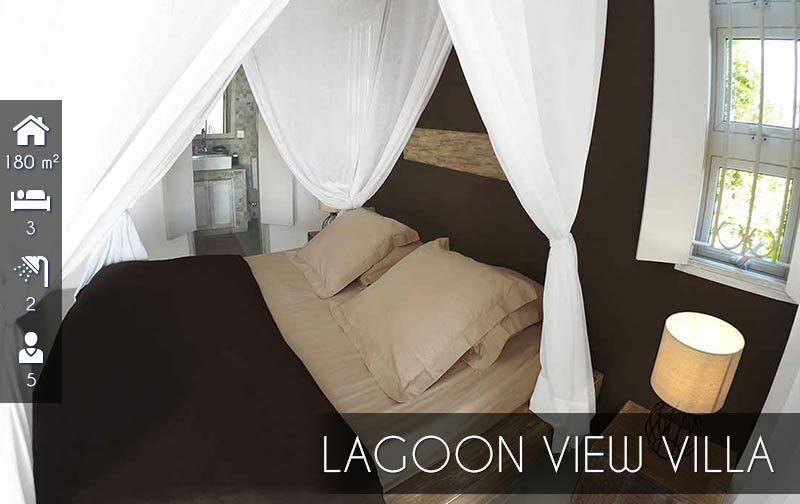 "Perfect for romantic stay and is the best position for kite Nice view and not noise at all. 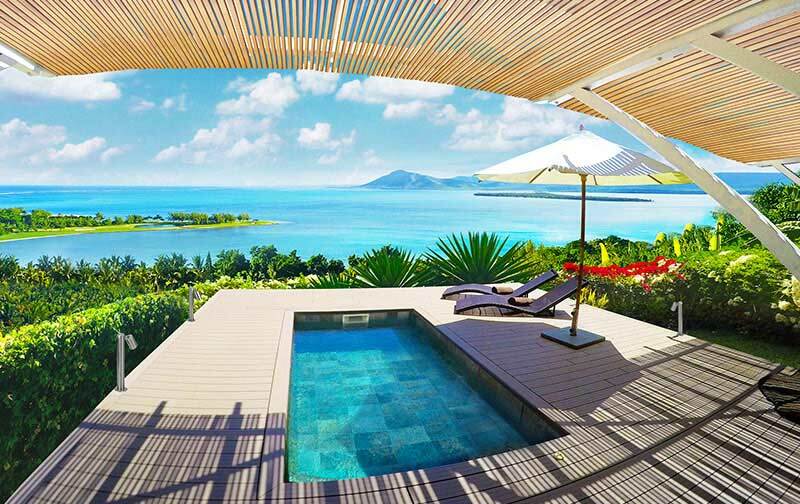 Top level apartment. 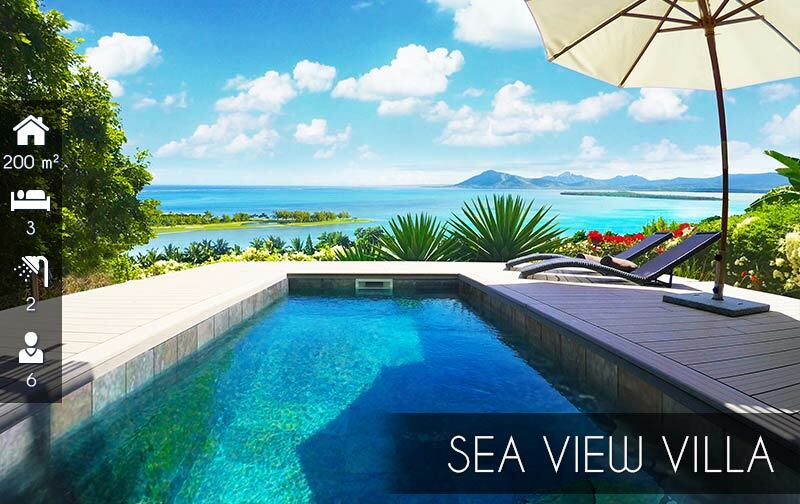 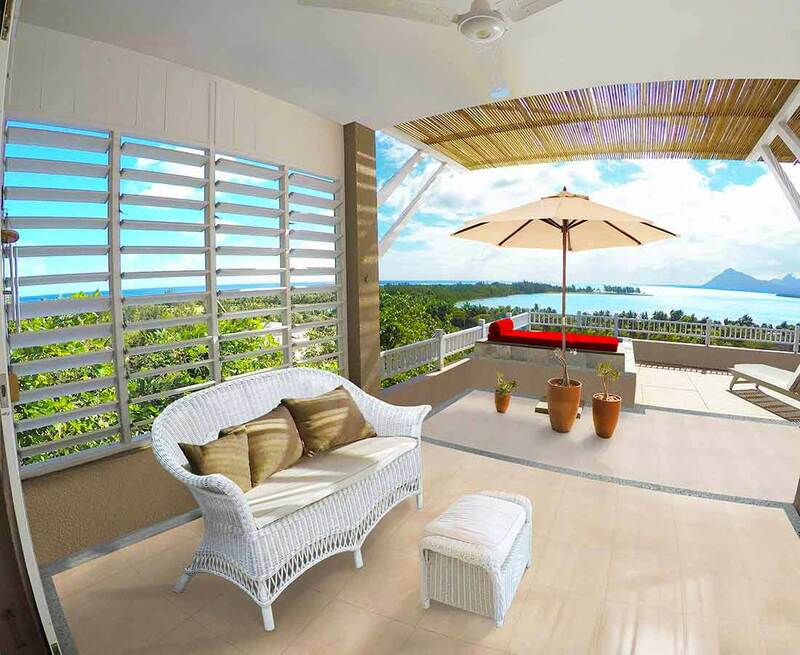 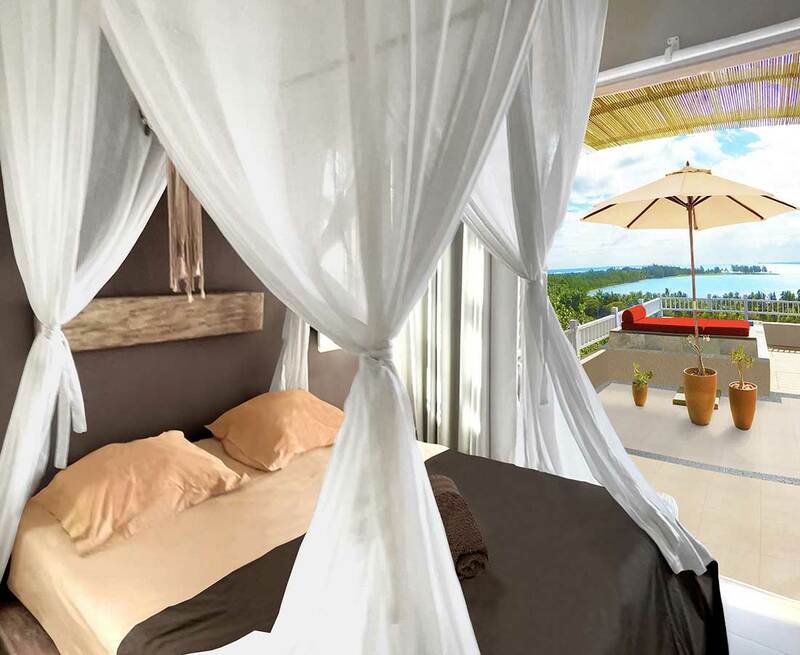 Perched high up on Le Morne Mountain, Kozy Le Morne Villa unfolds : 3 suites namely Lagoon View & Sea View and Island View. 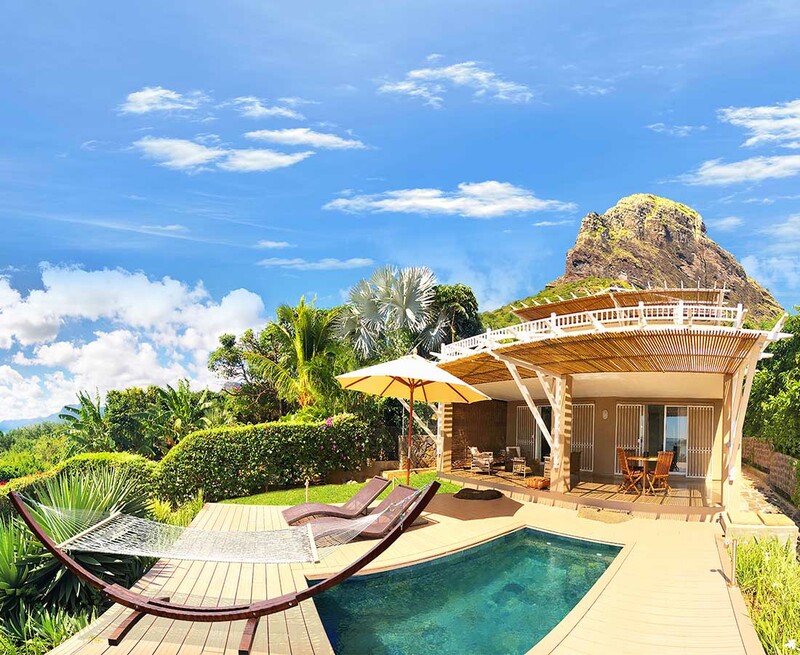 3 cosy places for the perfect private getaway that will make your life no less than a royalty, in Le Morne, Mauritius. 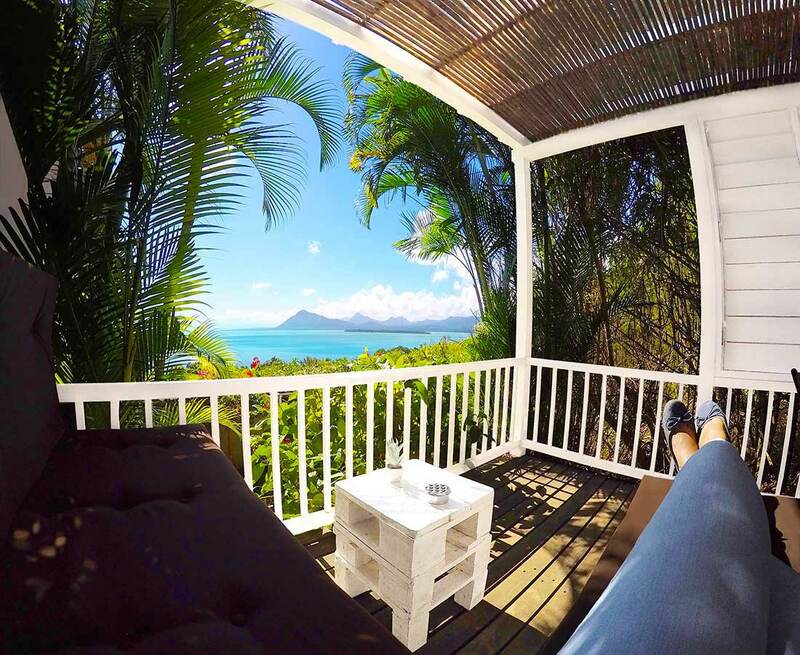 So relax and feel one with nature !